"This is the zero moment of consciousness. Stuck. No answer. Honked. Kaput. It's a miserable experience emotionally. You're losing time. You're incompetent. You don't know what you're doing. You should be ashamed of yourself. 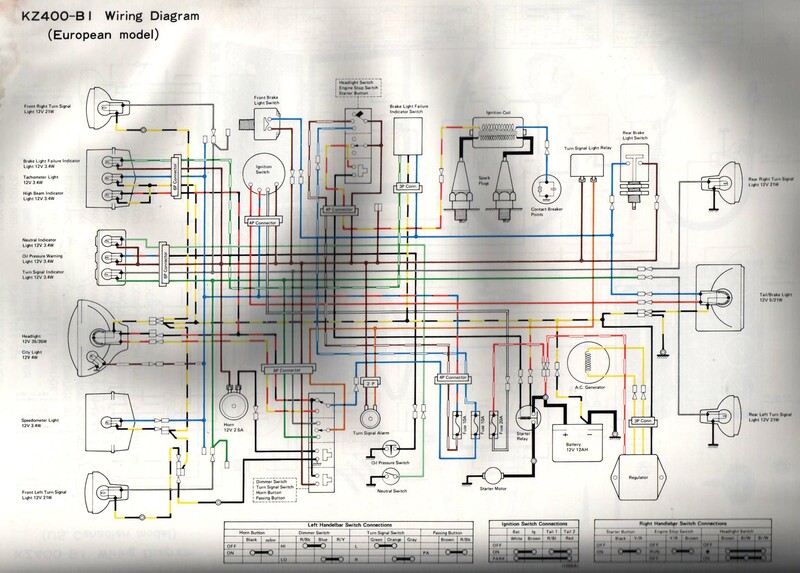 You should take the machine to a real mechanic who knows how to figure these things out. It's normal at this point for the fear-anger syndrome to take over and make you want to hammer on that side plate with a chisel, to pound it off with a sledge if necessary. You think about it, and the more you think about it the more you're inclined to take the whole machine to a high bridge and drop it off. It's just outrageous that a tiny little slot of a screw can defeat you so totally. What you're up against is the great unknown, the void of all Western thought. You need some ideas, some hypotheses. Traditional scientific method, unfortunately, has never quite gotten around to say exactly where to pick up more of these hypotheses. Traditional scientific method has always been at the very best, 20-20 hindsight. It's good for seeing where you've been. It's good for testing the truth of what you think you know, but it can't tell you where you ought to go, unless where you ought to go is a continuation of where you were going in the past. Creativity, originality, inventiveness, intuition, imagination..."unstuckness," in other words...are completely outside its domain. " 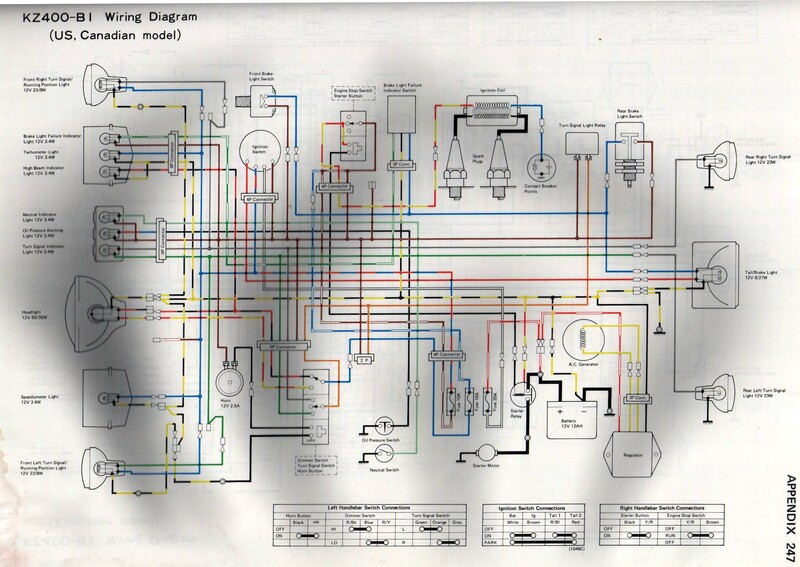 Robert Pirsiz - "Zen and the Art of Motorcycle Maintenance"
The PCV, Positive Crankcase Ventilation system. 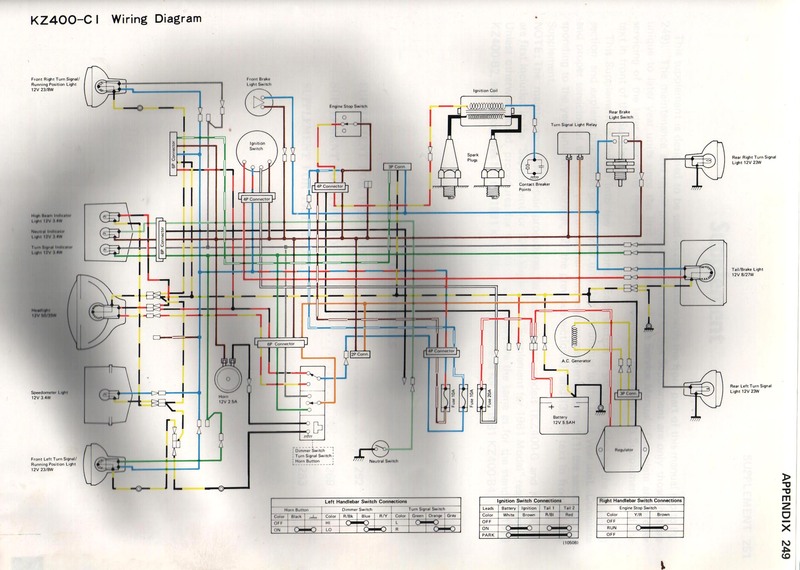 1976 Lincoln KZ400 D3 Wiring diagram. 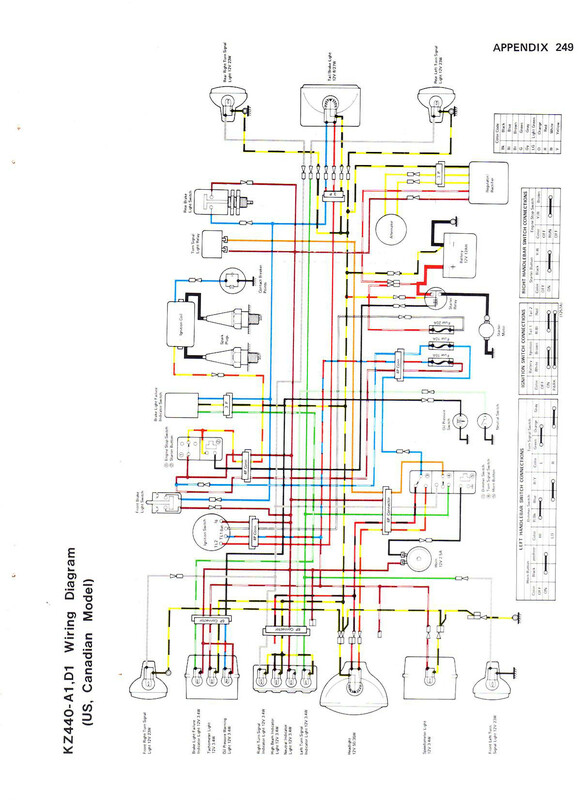 1976 KZ400 D3 Wiring diagram. 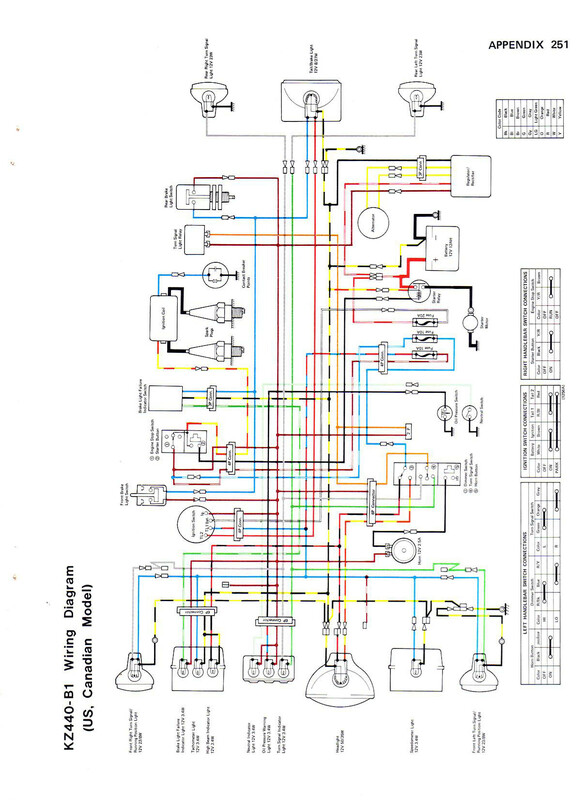 1978 - 1979 KZ400 B1/B2 wiring diagram. 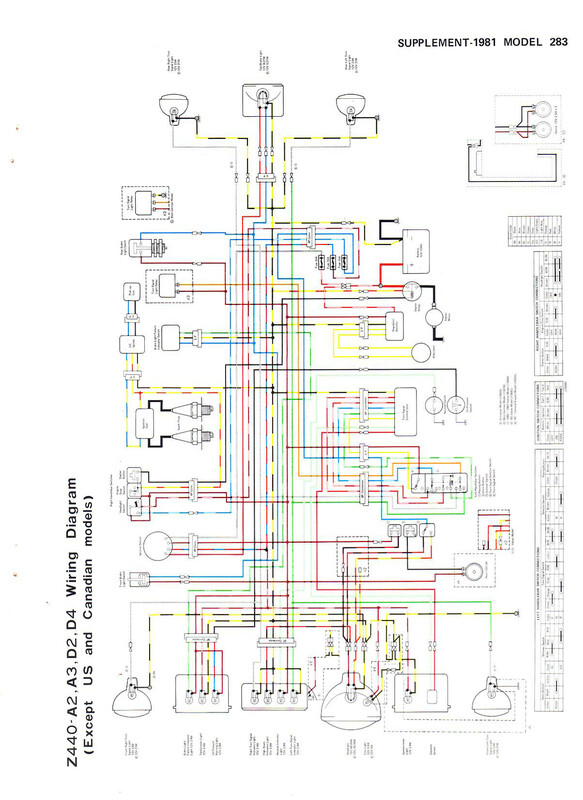 1980 Z400 B3/G2 wiring diagram. 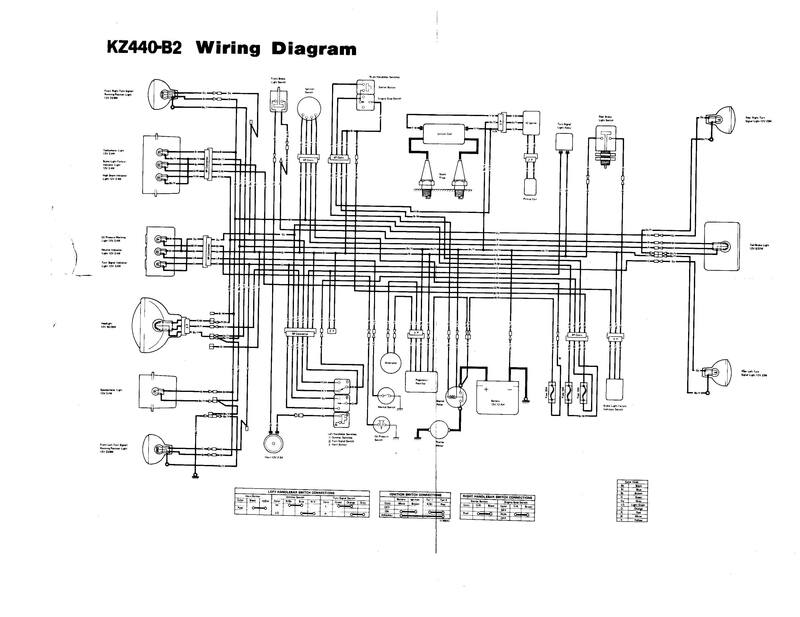 1981 KZ440 A,D Wiring diagram US, Canada. 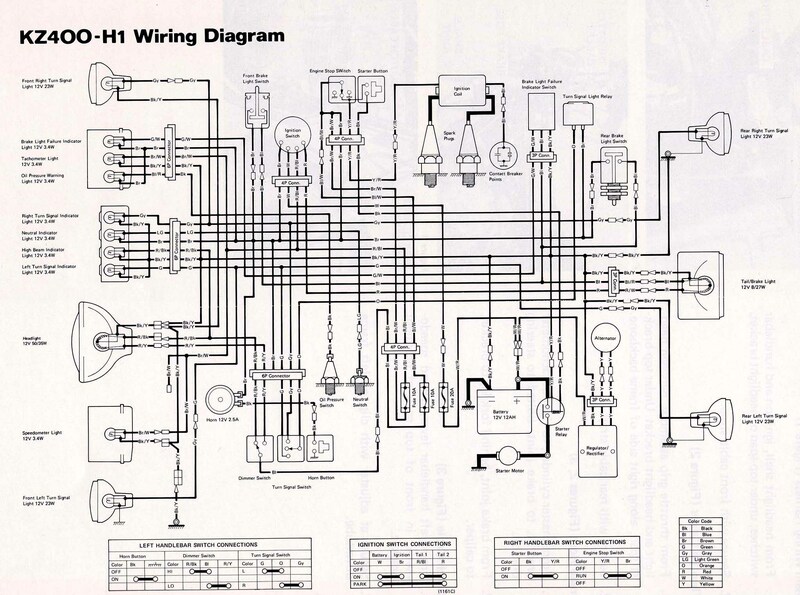 1982 - 1983 Z440 H Wiring diagram, European. When the site opens, just remove the -D3 behind KZ400 (or -A1 behind 440) in the model name box and click on the SEARCH button. 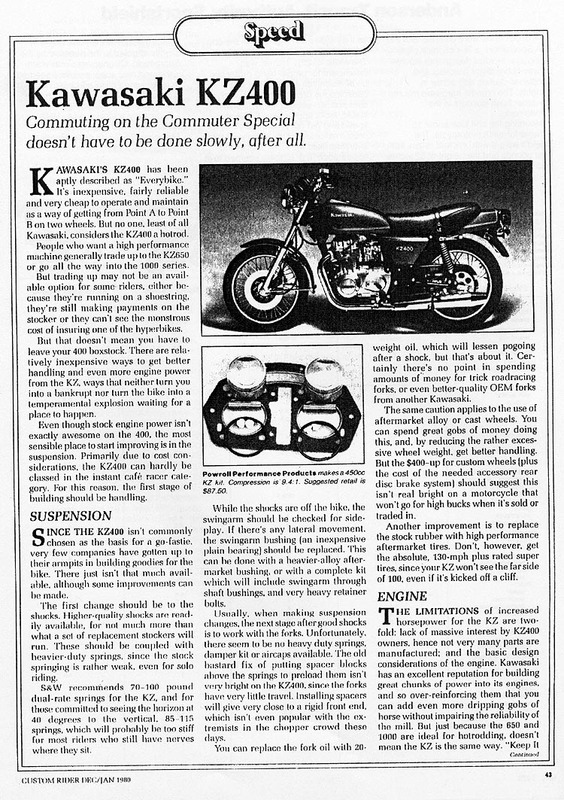 Then all the KZ400 models will be listed. 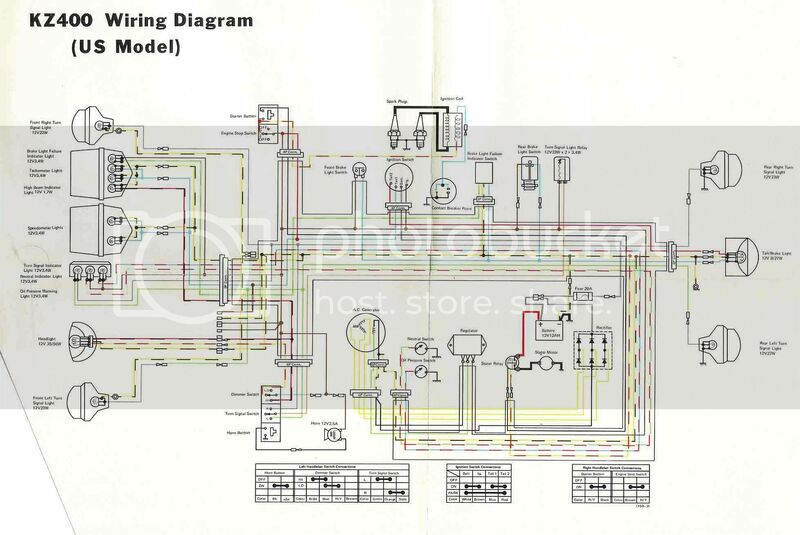 Just click on the model you are looking for and the parts lists and diagrams will be available. At the moment the links seems to be unstable. 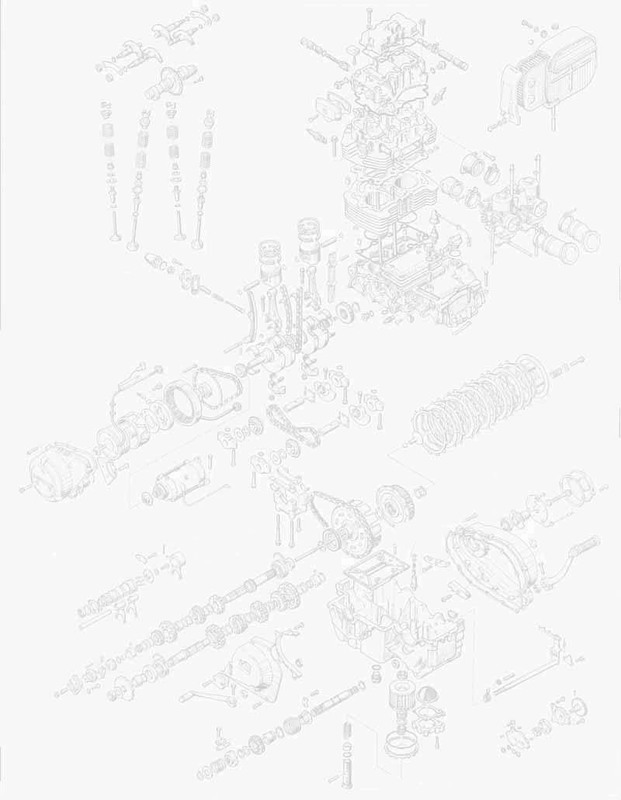 If you you don't get the parts diagram site directly, click on both links a couple of times and they should work. This guide is first of all written for those who are looking for a running bike. 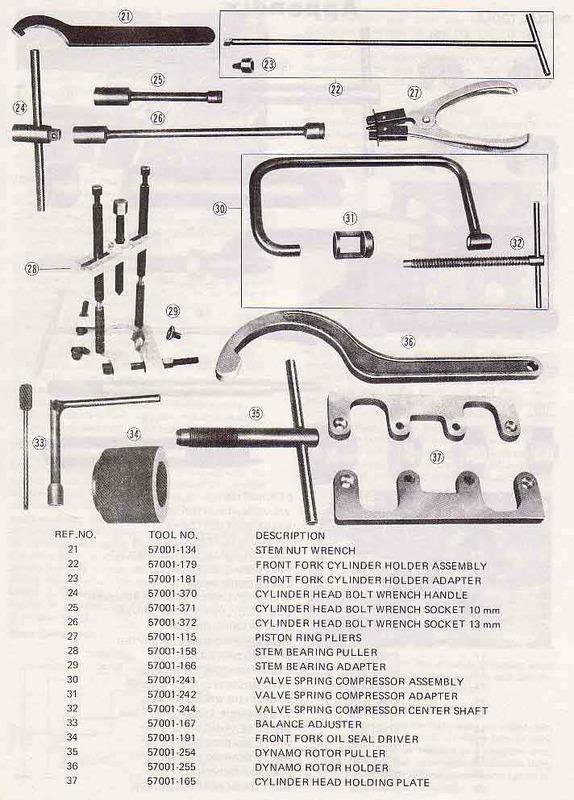 But those who are buying a bike for restoration might find it handy as well. Motorcycles come in a wide range of sizes. Usually, the tendency is to think of size as a function of engine displacement. Generally this is true. A 50cc moped is almost certainly going to be a lot smaller than a Boss Hoss, which fits a 350 CID Chevy small block into a motorcycle frame and weighs in at about 1100 pounds. But even within a given displacement there are size variations. For a beginning rider, a smaller bike is generally best. Something in the 250 - 600 cc range is a good place to start. Remember, though, that a 600 Ninja is, performance wise, a much faster and more dangerous beast than a 1200 cc Harley. I know a lot of younger riders are going to want to start with a sport bike of some sort simply because they look cool. But a cruiser, standard, or an older UJM (Universal Japanese Motorcycle) is really a better place to start. You're not going to destroy $1500.00 worth of plastic if your KZ400 falls over at a stop light, but you could do so very easily on the Ninja. On the other hand, a 6'4", 220 pound beginner may find a full-sized cruiser or standard quite comfortable. The only way to be sure is to sit on the bike and, if you can, ride it far enough to tell if you'll be able to handle it. Don't be caught up in the "size above all" syndrome, which always says, "Don't get something you'll outgrow in six months." Not everyone does. I've been riding a KZ400 for a long time, and it has worked just fine for me. One of the things you should consider when it comes to size is how you plan to use the bike. If you're going to be carrying a passenger most of the time, a larger displacement bike makes sense. If you'll be riding solo, on the other hand, you need enough power to handle highway speeds comfortably, and ergonomics that fit your body. If you can get those in a lighter bike, don't worry about someone who figures you're going to find the potential to hit 175 mph of vital importance in a few months. Be sure that all paperwork is correct and in order. The serial/engine numbers or VIN should match what's on the title. Be suspicious of any bike that doesn't have a title. You should always bring along a friend, or another person you trust, and who has got a fair amount of knowledge about motorcycles. It is one of the best insurances you get. Both for a second opinion, before you make a decision, and as a witness if necessary. Check the wheels for run out. Also check the wheel bearings for free play by grabbing the wheels at their highest and lowest point and try to wiggle them back and forth. 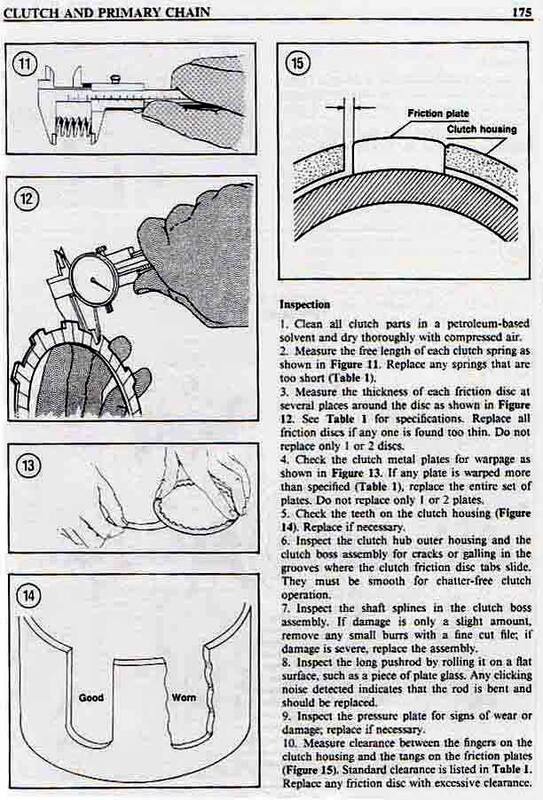 Check the chain wear by checking the chain adjusters. If they are used up, the chain is worn out. 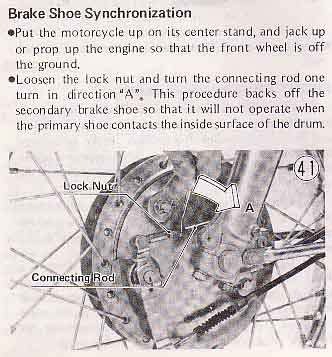 Also check it by lifting it off the rear sprocket on the rear of the sprocket. 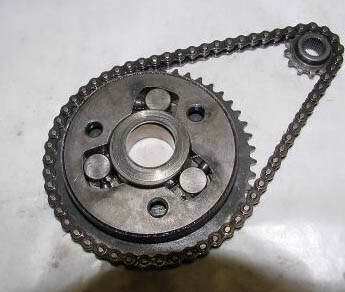 If you have more than ½ teeth between the chain and the sprocket, it is worn out. Also check the teeth on the sprocket. They should not be bent, or have signs of uneven wear. 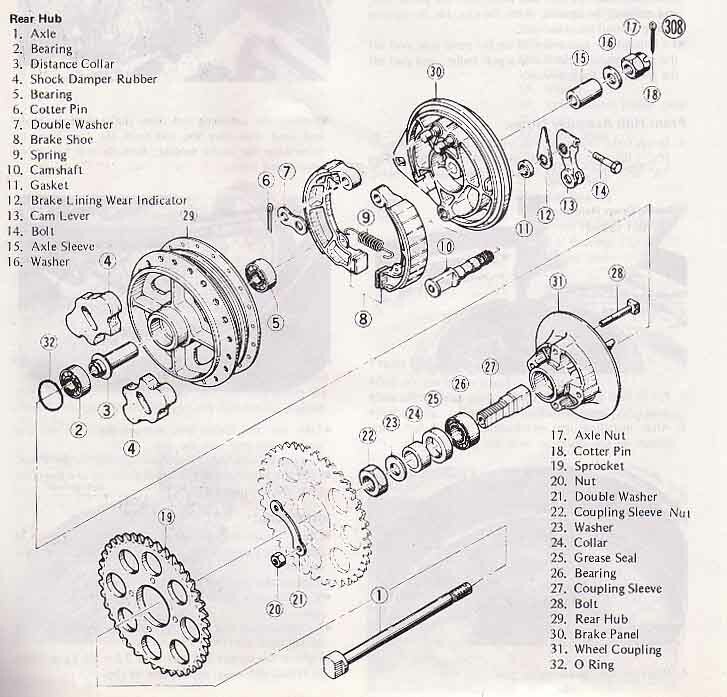 Then check the rear coupling bearing for free play by wiggling the rear sprocket, and the rear coupling dampers by engaging first gear and move the wheel forth and back in the drive direction. 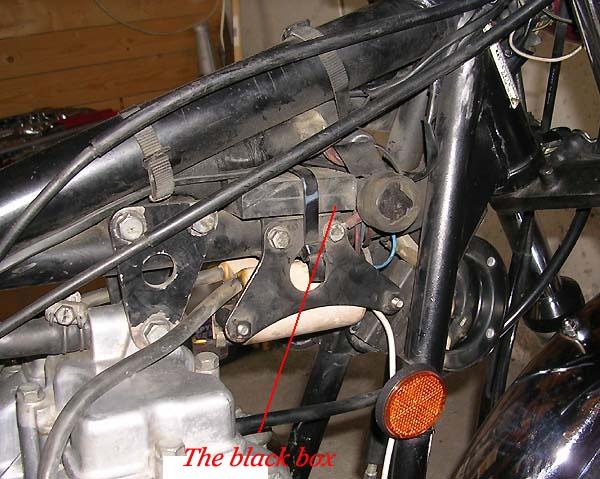 Check the fork tubes for rust pitting, and the fork seals for any leaks. Check the fork for smooth operation. If the fork is binding, you might want to look elsewhere. 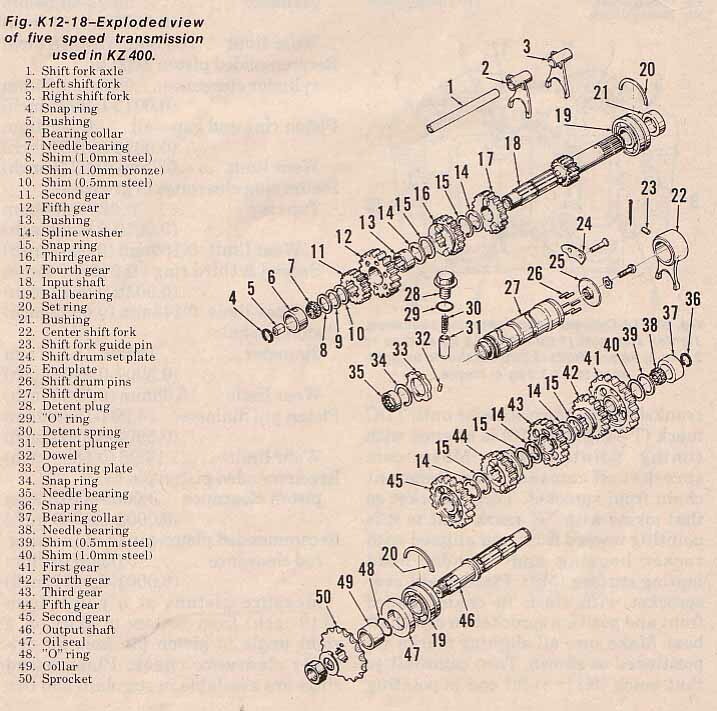 Make sure the rear shocks and springs are functioning properly. 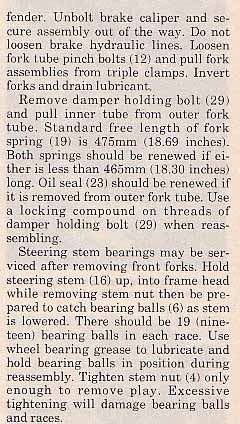 Also, make sure that the head bearings in the fork operate smoothly, and without any play. With the front wheel off the ground and someone holding the handlebars firmly, try to move the fork. There shouldn't be any obvious play. If you have access to a mechanic's stethoscope, rotate the wheels and listen for bearing noises. Also check the rear swing arm for free play. With the bike on the centre stand, grab the wheel at the rear and push the wheel sideways back and forth and look for free play in the swing arm pivot. 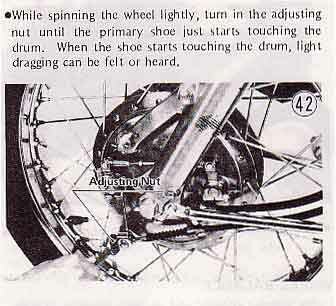 Rotate the wheels and operate the hand and foot brakes. 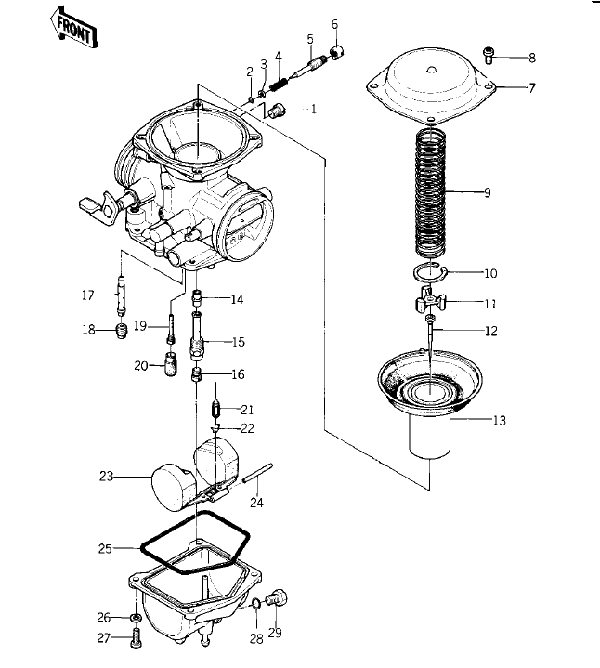 If a drum brake is binding, find out why. 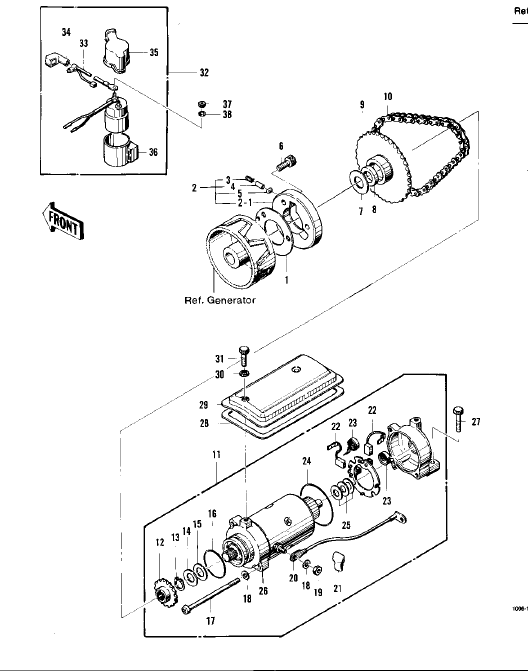 If the problem is lack of lubrication on the cam shaft, the problem is easily fixed. If something is broken it can get more expensive, so you need to know which. 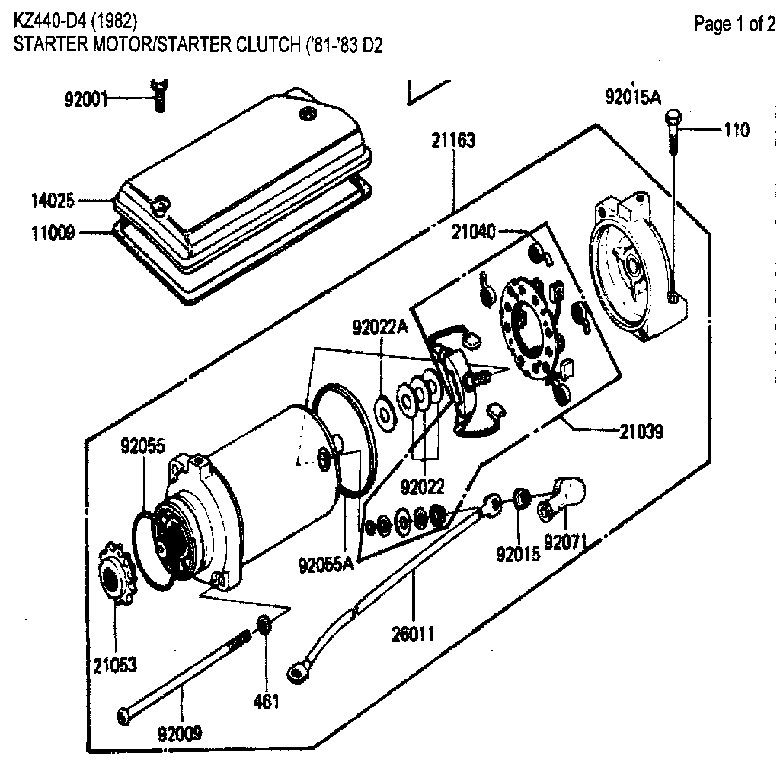 Look at the brake fluid through the reservoir sight glass. Straw colour is normal, muddy brown means the fluid is contaminated and will have to be replaced. 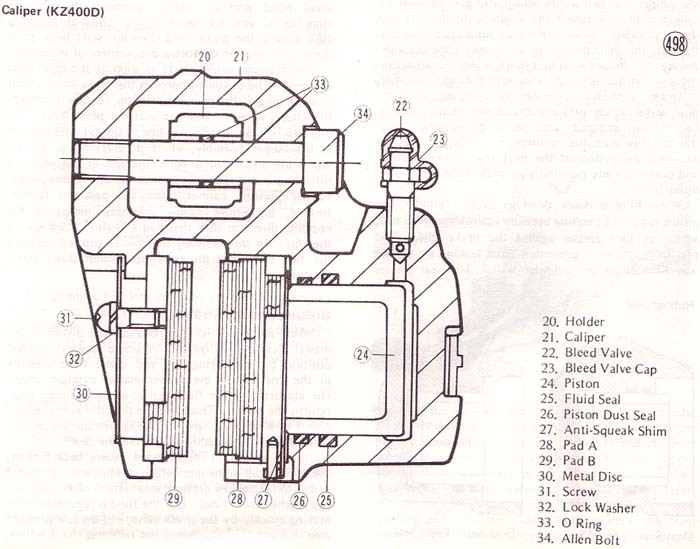 Too much crud in the brake fluid can cause the callipers to drag by preventing the pistons from fully retracting. Look at the brake lines, too, to make sure they're not about to burst or disintegrate with age. Make sure that none of the cables are binding. Check where they attach to the levers for any sign of fraying. If you can see the other end, check that as well. If the cables are rusty, figure they'll need to be replaced. This is another place where that mechanic's stethoscope is going to come in handy. 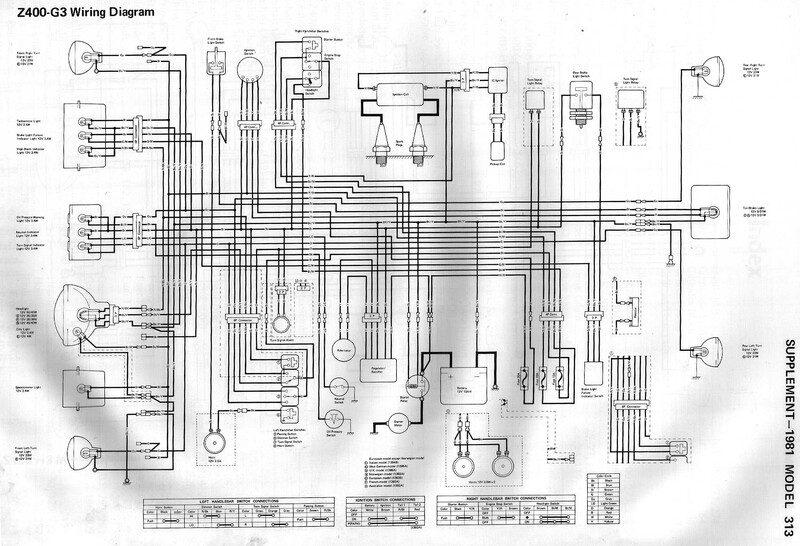 The first thing to check on the engine is, of course, whether it will start. Listen to the starter, if there is one. 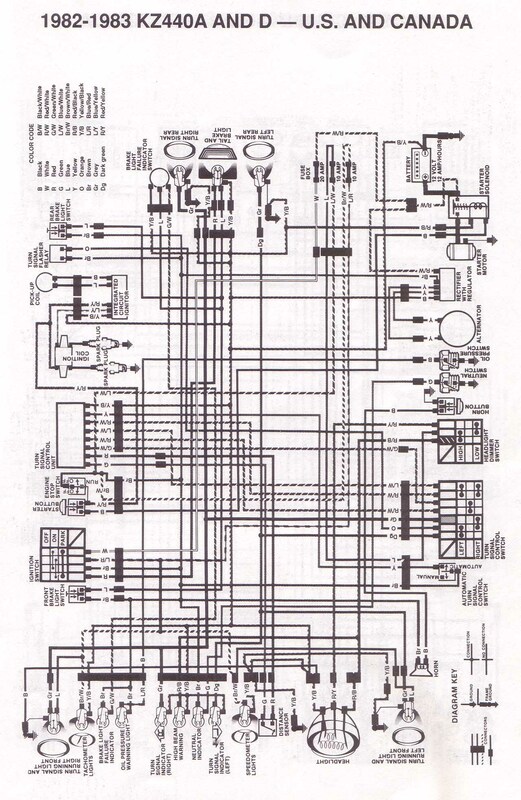 Or note how many kicks it takes to get the engine going. If the bike has been sitting for a long time, just getting it started can be nearly impossible. 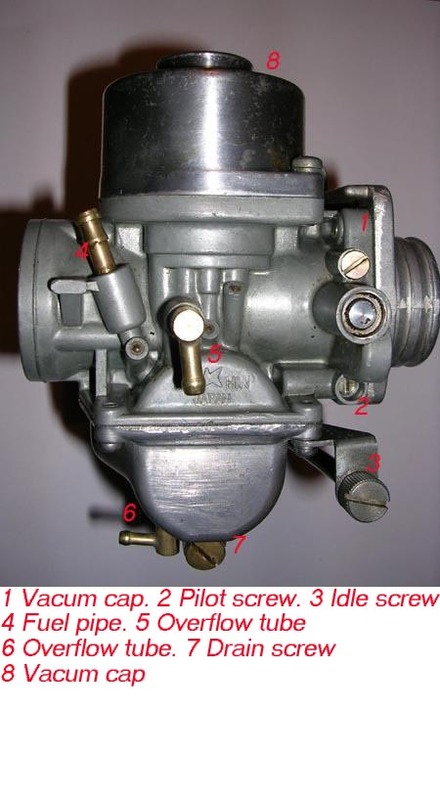 Gasoline in the carburettor(s) will turn into hard varnish over time, and gas in the tank will deteriorate into something that doesn't burn very well. 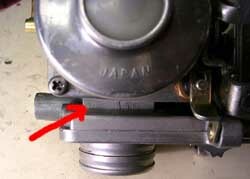 Also beware of rotten vacuum piston diaphragms on the 400B and 440 model carburettors. These are expensive to replace, and if they are cracked, it will reveal itself by a lack of top end power in all gears. 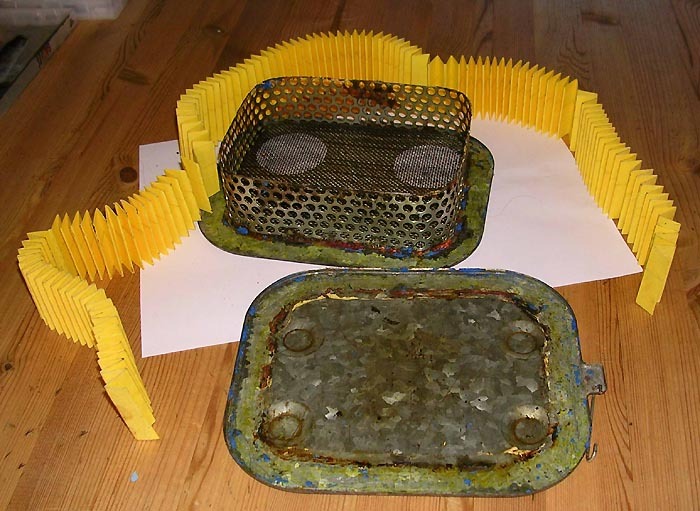 Iron block engines can rust up if enough moisture can get inside the cylinders. Mice like to make their nests in old bikes, and will chew up some of the softer parts in the process. 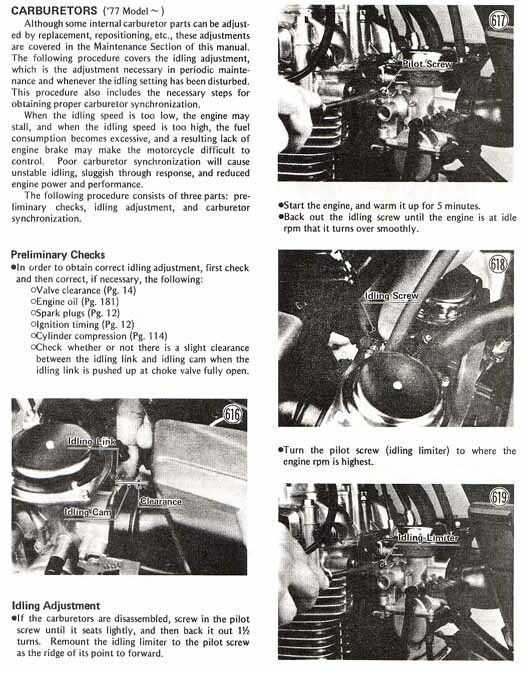 With the engine running, get out the stethoscope and listen carefully. Motorcycle engines are pretty noisy inside, but some noises are a lot more ominous than others. Bad bearings will make a distinctive noise. So will other parts that have worn beyond tolerance. If you're not sure how to tell the difference between a $3.50 noise and a $1500 noise, take someone with you who does. Also check for heavy vibrations in the engine. These engines will have some vibrations, but it should not be excessive. 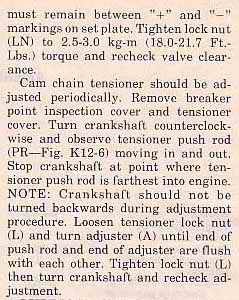 If it is, the crank balancer chain might need to be replaced. It’s an engine out job. And check for excessive exhaust smoke. 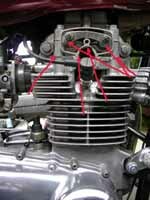 Bluish smoke and/or the smell of burnt oil can indicate worn piston rings, or leaking valve stem seals. 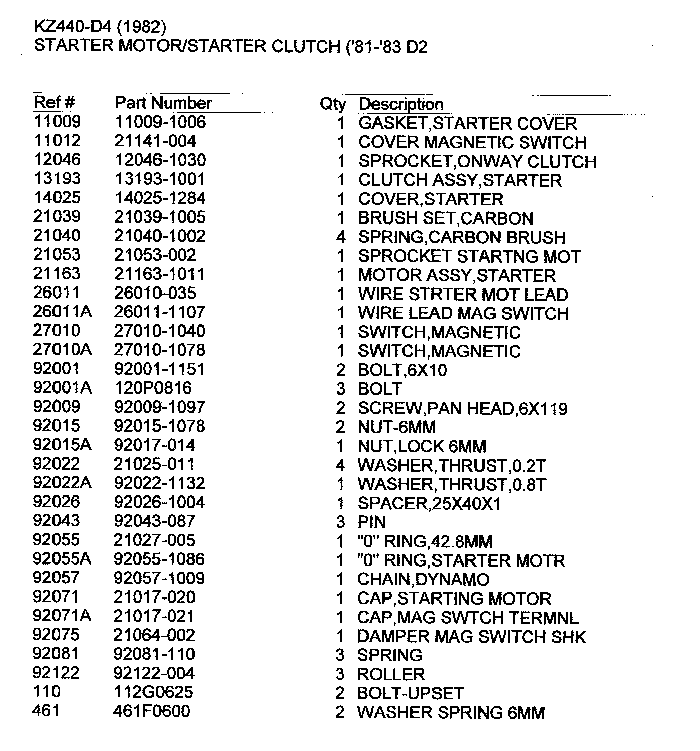 The clutch basket and primary chain will make some clatter at idle. That is normal for these engines. 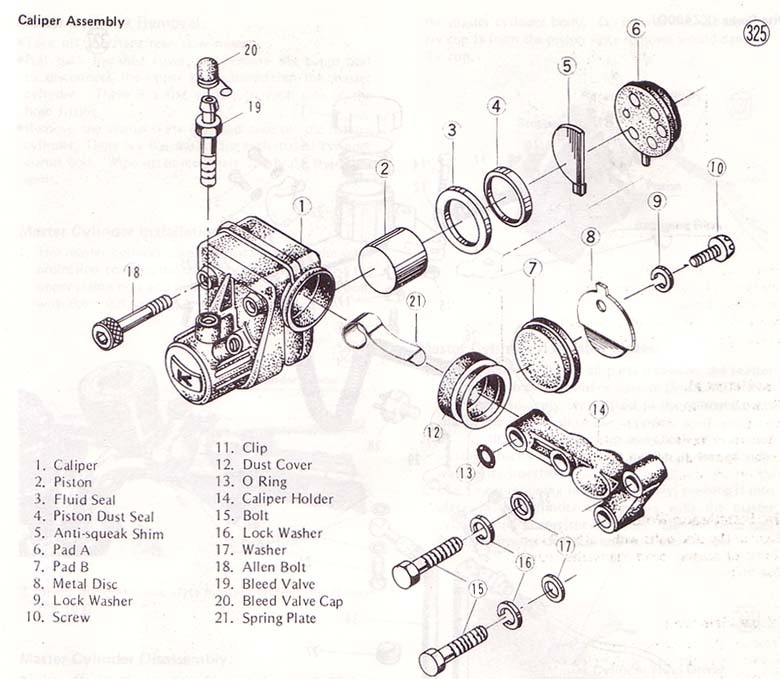 Also check the engine oil drain bolt, and the oil filter cover bolt, under the engine, in the bottom of the crankcase. If the bolt heads are rounded, it can be difficult to get it out for oil changes, and it tells you about how the bike has been maintained. 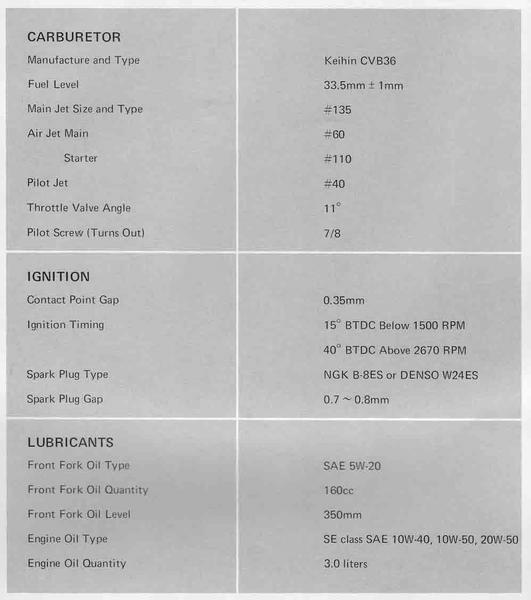 Also check the oil level and the colour of the engine oil through the oil level sight glass on the right side of the engine, low down on the right side engine cover. The level and the colour of the oil will tell if the oil has been changed in time, and if the owner has been running the engine with the correct oil quantity. 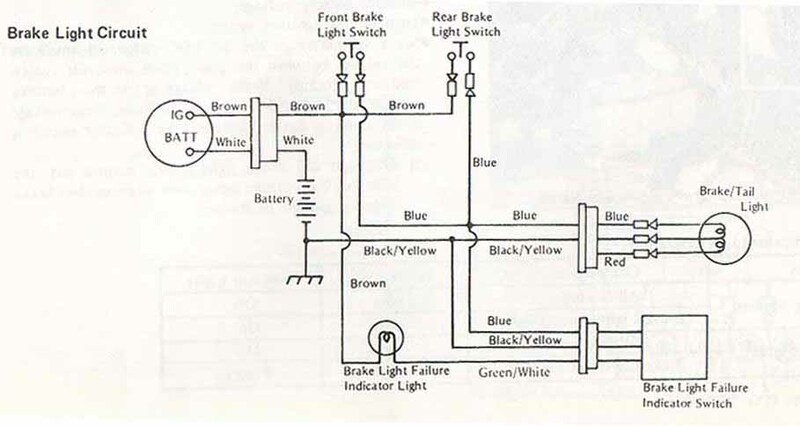 Check all lights and switches for proper functioning. 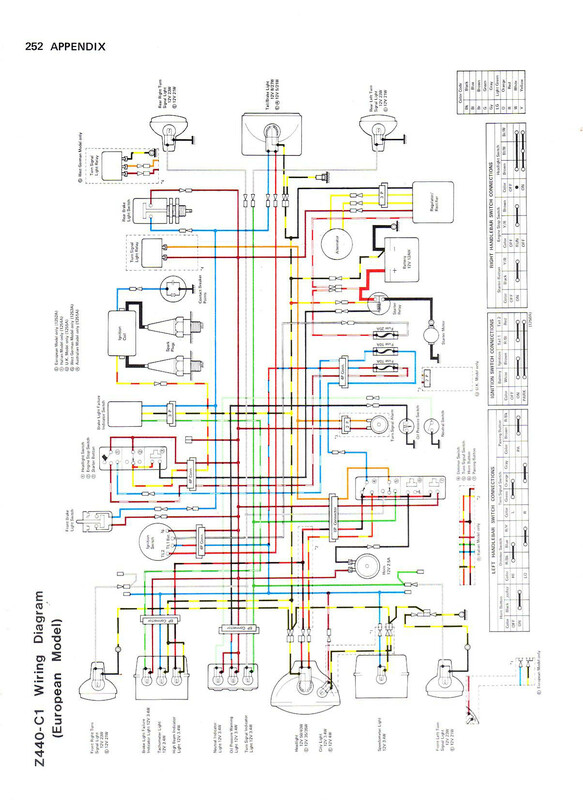 Make sure that the kill switch actually shuts off the engine. (You will sometimes find bikes where an owner has bypassed the kill switch for some unfathomable reason. 99% of the time this doesn't mean much; the other 1% not being able to shut off the bike in an emergency can kill you.) 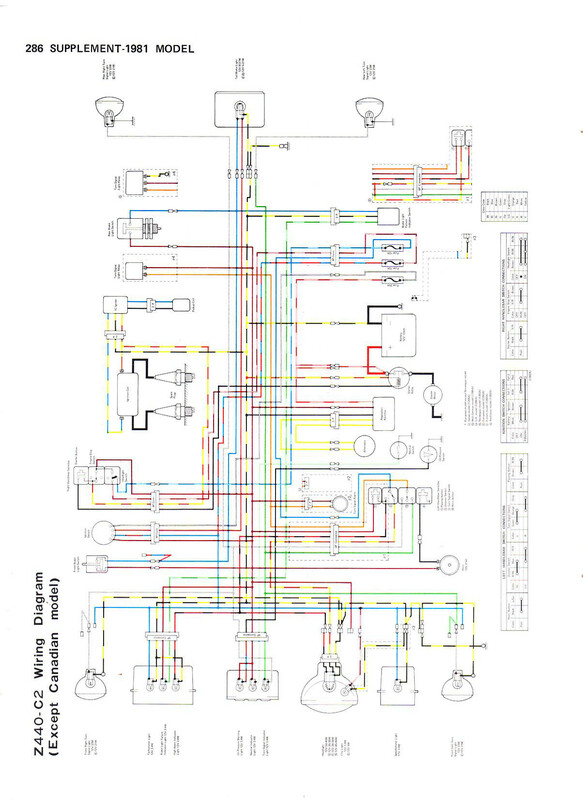 Take a good look at the wiring harness for workarounds and non-standard fixes, since electrical problems can crop up unexpectedly. And check if the charging system is working. 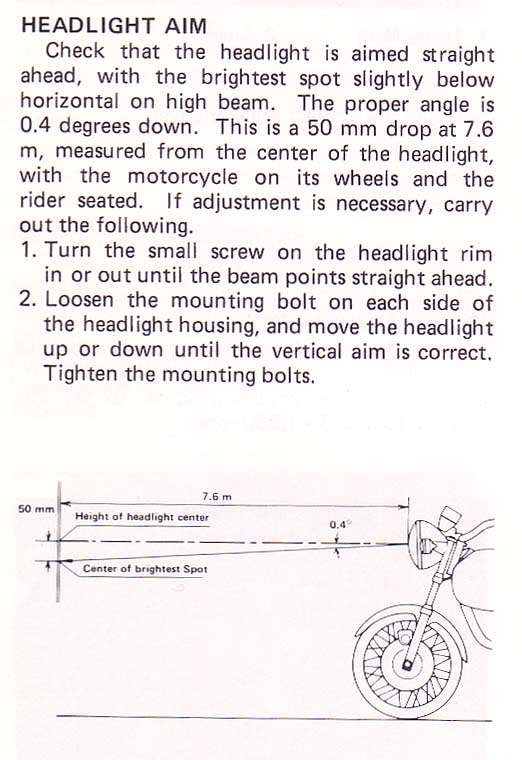 Let the bike idle and be sure the head light is on. Rev it to 2500rpm a couple of times while you watch the headlight. It should brighten up a little. 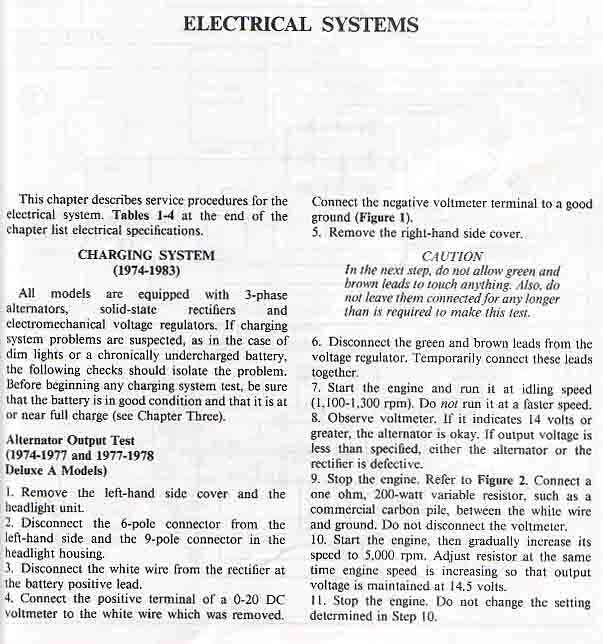 It is even better if you bring along a voltmeter, hook it up across the battery terminals, and check the reading. 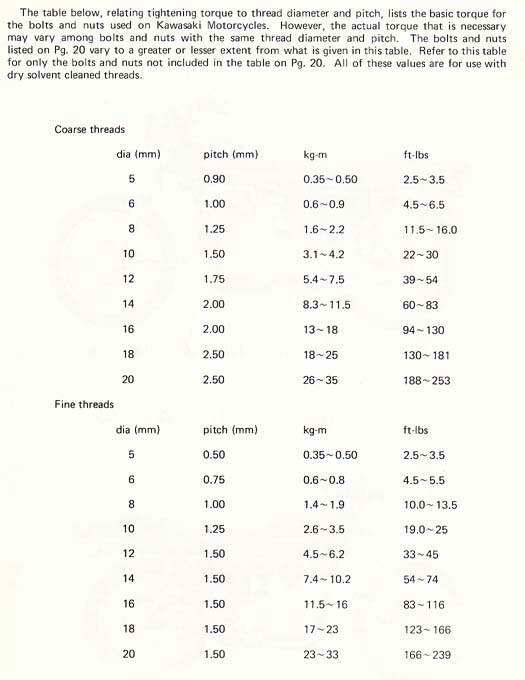 At 1500 rpm you should have 13, 5~14, 5 volt. Then raise the rpm to 3500. You should have the same reading. 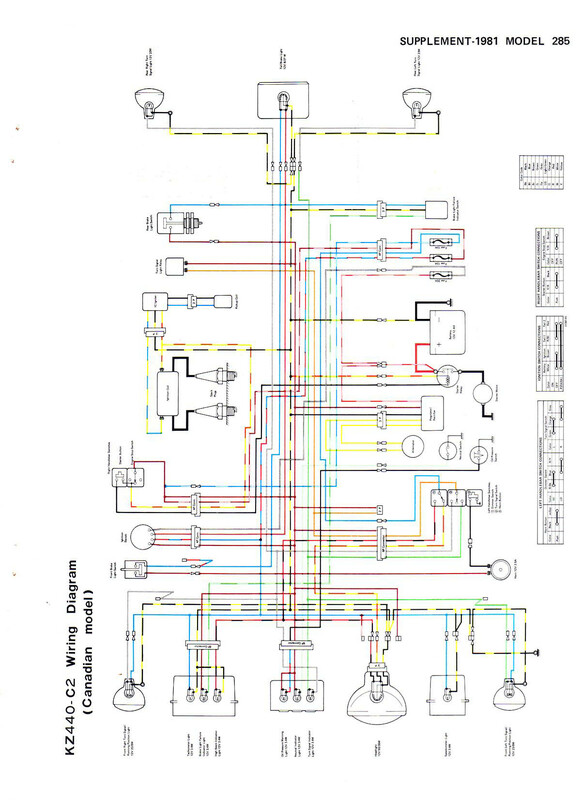 Take a good look at the exhaust system, because replacing one is expensive. You're looking for leaks, and you find them the same way you find leaks in an automobile exhaust. Use a rag to partially block the tailpipe with the engine running and see if anything leaks. If the system is stock, look out for rusted pipes/mufflers and rotted baffles. 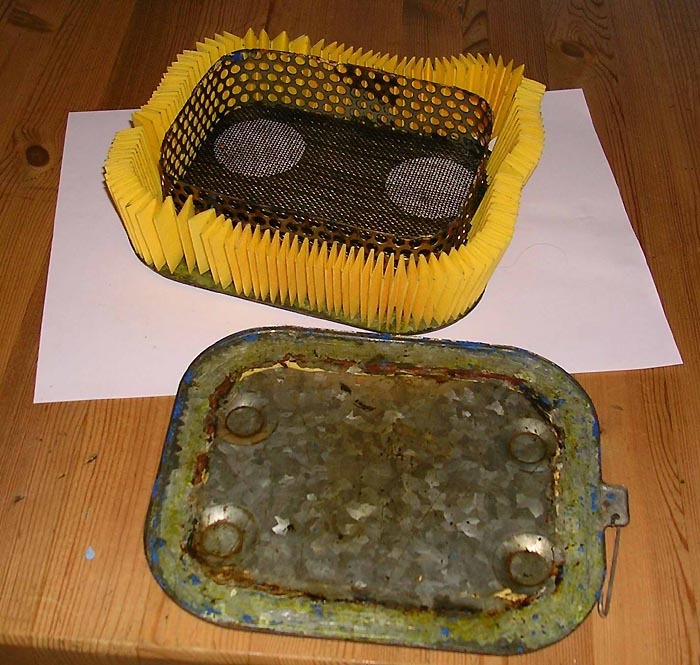 Check the fuel tank on the inside for rust. At the same time check the condition of the fuel cap gasket. Also check for any fuel leaks from the bottom of the fuel tank, the petcock or the fuel lines. This is really the least important part of buying a used motorcycle, but most buyers are going to be concerned with it. And the appearance of a bike can give some good clues as to how well the rest of the machine was maintained. Mostly, what you're looking for here is that the paint is intact, and that any chips have been taken care of before something starts to rust. Chrome should be shiny, or at least not covered with rust. Cracked upholstery can be replaced cheaply, but if the foam is also damaged the cost is going to go up quit a bit. And check the seat pan. It is made out of steel and it can be destroyed by rust. 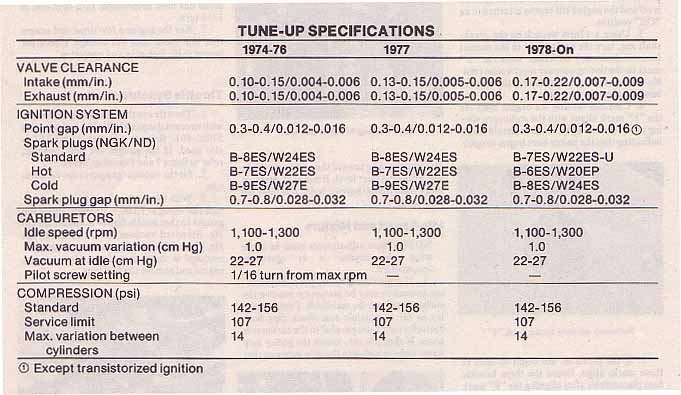 KZ400 and 440 tune up specifications. 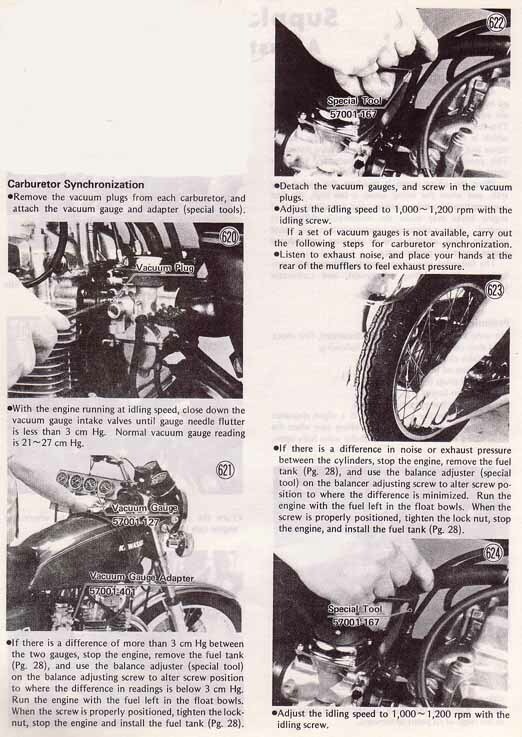 These tips are based on my own experience as a long term owner of a KZ400. I'm not a professional mechanic, I have a limited workshop space, and most of my tools are the tools owned by most average home mechanics. But I have always maintained the bike myself, and most of the work on these bikes can be done by a home mechanic, and on a limited working space. 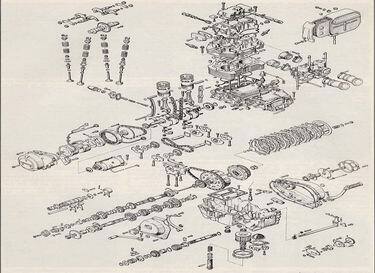 When it comes to repairing and maintain the KZ400, the issue are too big to be fully covered in one page. There was a number of model changes during the production period and my own experience are with the early 1974-1977 models. And some of my tips will be a result of that experience. Other tips will be useful for all models I hope. 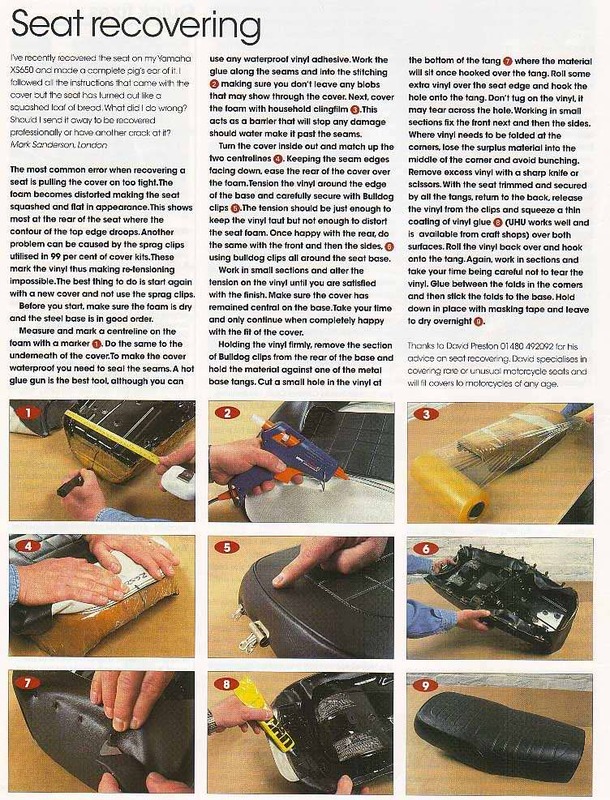 But since I'm not a professional mechanic I feel that I don't have the skills needed to write a repair guide. That is fully covered in the workshop manuals that already exist. There are a few things that are important to remember that I will point out though. The rest I will cover with links to a few web sites that I think will cover most of the repair of the bike. There is one important thing to have in mind though. 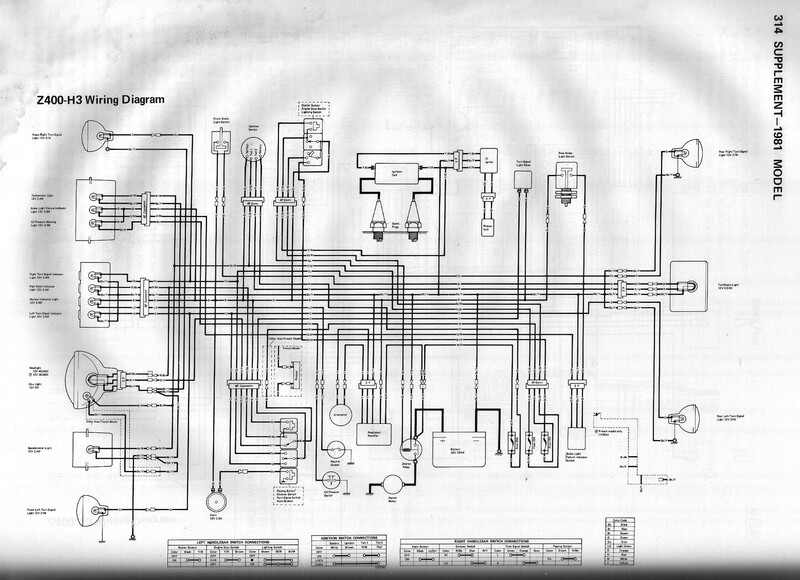 The engine construction is the same for the 1974 - 1977 models. 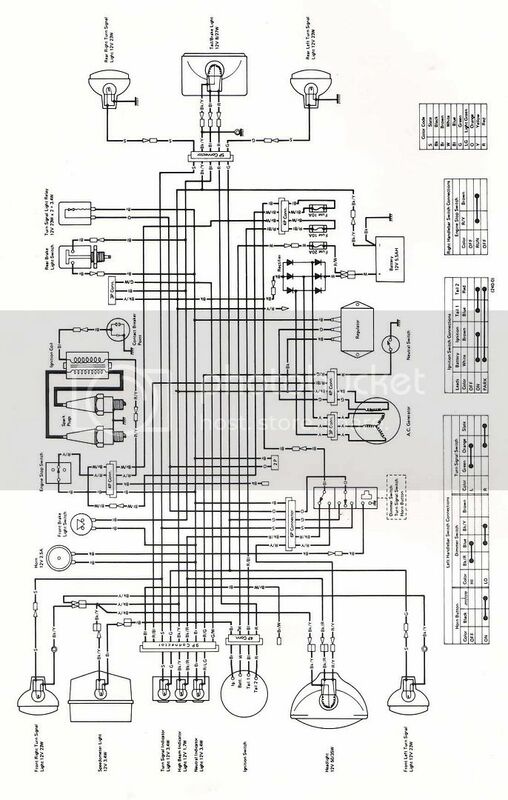 For the 1978 models the top end was changed and the engine got a new cylinder and cylinder head, and they can not be interchanged with the ones from the 74 -77 models. 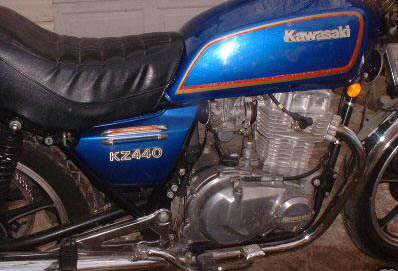 The KZ400 are an easy bike to maintain as long as you know what you are doing. 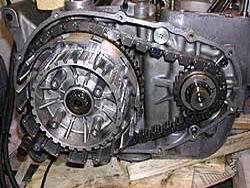 The starter, the generator and the clutch are easy to get at, and you can overhaul the top end without taking the engine out of the frame. Also the rear wheel can be removed without dismantling the mufflers or disturbing the chain adjustment. 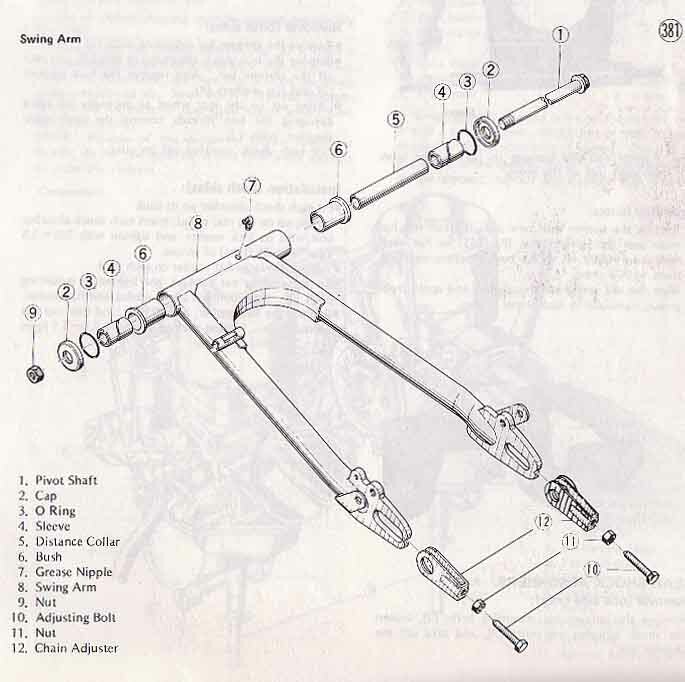 Also replacing the front fork seals and changing the oil in the front forks is a straight forward job. Changing engine oil and replacing the oil filter are another easy job. All in all, a periodic service can be done whiten a couple of hours. 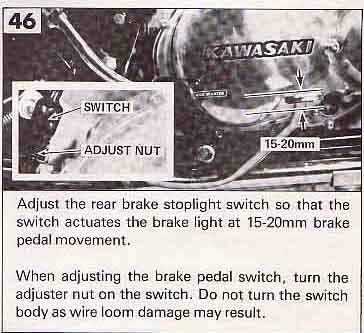 But before you start I will recommend that you buy a Kawasaki workshop manual, and/or a Clymer manual that covers the model you have. You will need one for the service specifications. They will cost about the same as a 2 hours job at a motorcycle workshop. Another thing that I have done trough the years is keeping a diary. Every time I do something with the bike, any adjustment or repair, or replacing parts, or whenever I see or hear something worth remembering, I write it down in the diary. And then if something happens, or when I adjust or replace something, I can always go back and read my notes. That can be very helpful sometimes. And I recommend that you follow the service and oil and oil filter changing intervals rigidly. And that you use good quality oil. 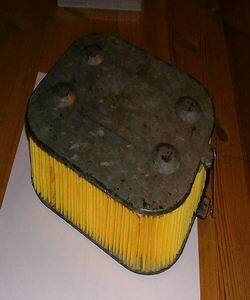 I replace the oil filter every time I change the oil. I have replaced all the wheel bearings with the enclosed type. 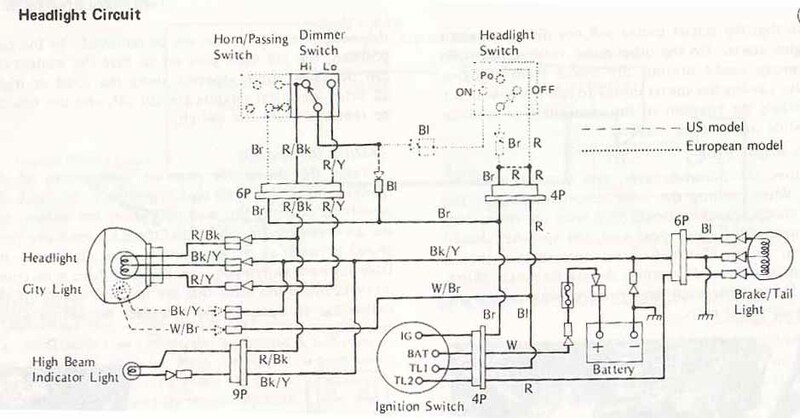 I also replaced the point’s ignition with an electronic ignition system from Boyer Brandsen. Once the ignition is set you don't have to adjust it any more. 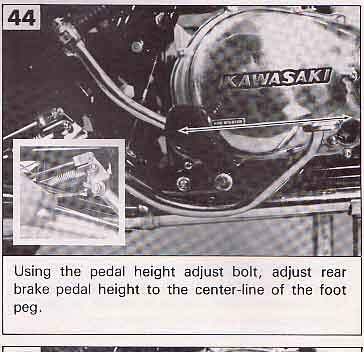 Just a tip for buying points, if you have a problem getting the ones for the KZ400, you can buy points for a Honda 550/750 four. They are the same. Another thing I have replaced on my bike is the brake light failure unit. And I discovered that you can use one from the KZ650. And I think the unit from a Z1/KZ900 will fit also. 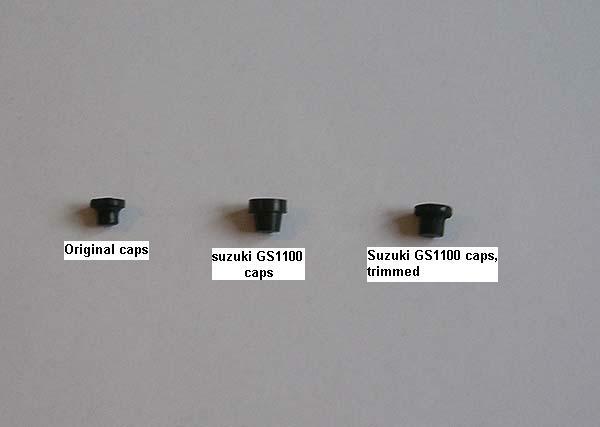 Also the fuel tank cap gasket is the same for the KZ400, 650 and 900. When it comes to tyres there are a lot of brands and types to choose between. Personally I have tried several, and I have gone up from 3.50" to 4.00" on the rear tire. I think that makes the bike more stabile. But it does make it harder to rev the bike out on 5.gear. Now days, I'm using Dunlop K82 on the front wheel, and Dunlop K70 on the rear. 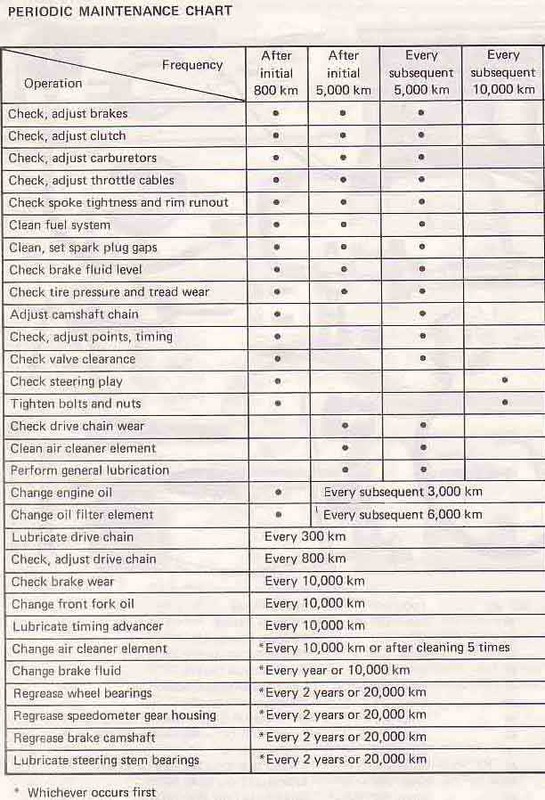 For those who want to use modern tires you will find a conversion chart here. And here you will find out how to replace tires yourself. 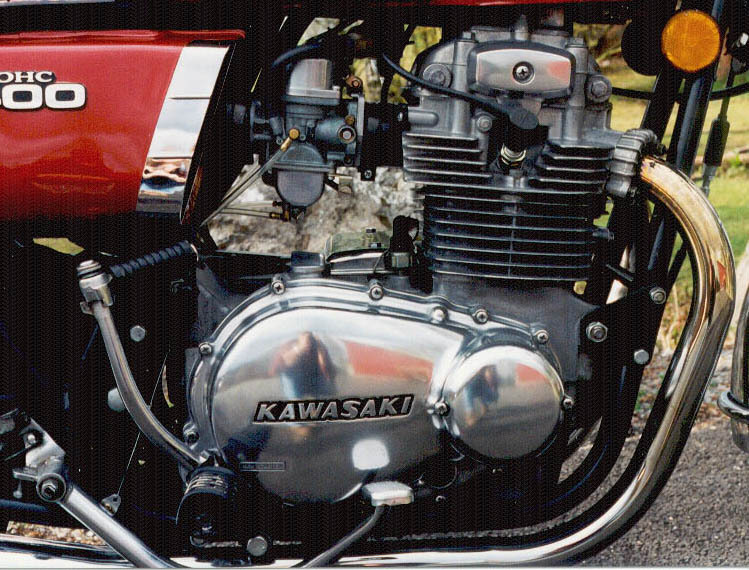 And Classic Motorcycle Mechanicscovered a KZ400 engine rebuild over three issues from December 2002 to February 2003. Back issues can be bought here: Back Issues. Parts are sometimes easy to find, and some parts are harder to come by. 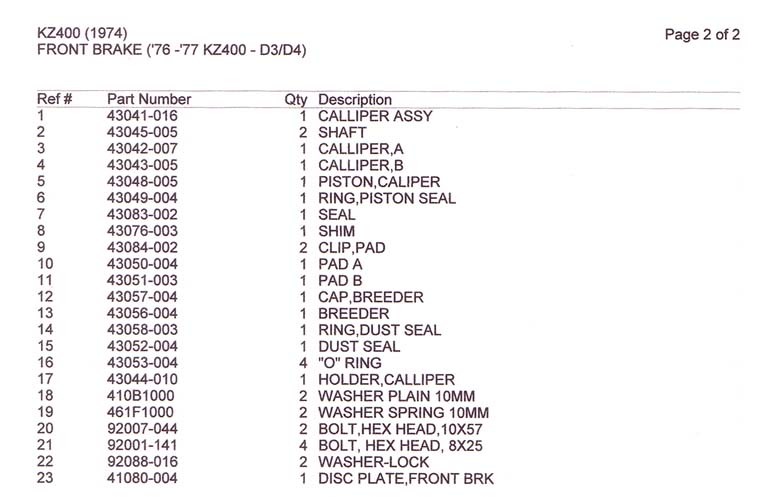 In general, there are still a lot of suppliers that can supply a lot of parts for the KZ400, but prices can be high. An alternative will be to search for parts on online auctions like EBay. There are a couple of suppliers that have specialized on parts for old KZ's: Z-power in England and Australia, and Klasmo bikes in Germany. You will find links to part suppliers on the Links page. 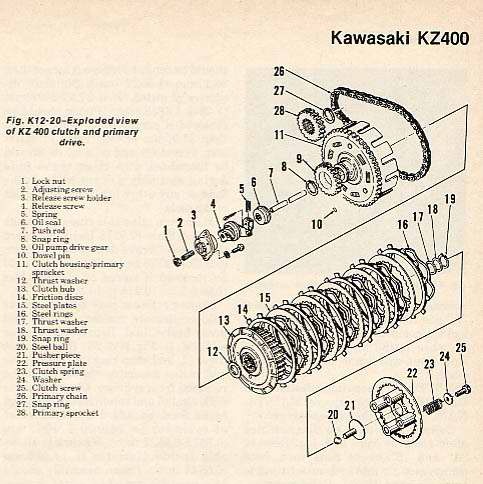 It is recommended that you have a parts list for your bike, because suppliers are going to ask for the Kawasaki parts number when you are ordering parts. But if you do not have it, you will find it online at kawasaki.com. 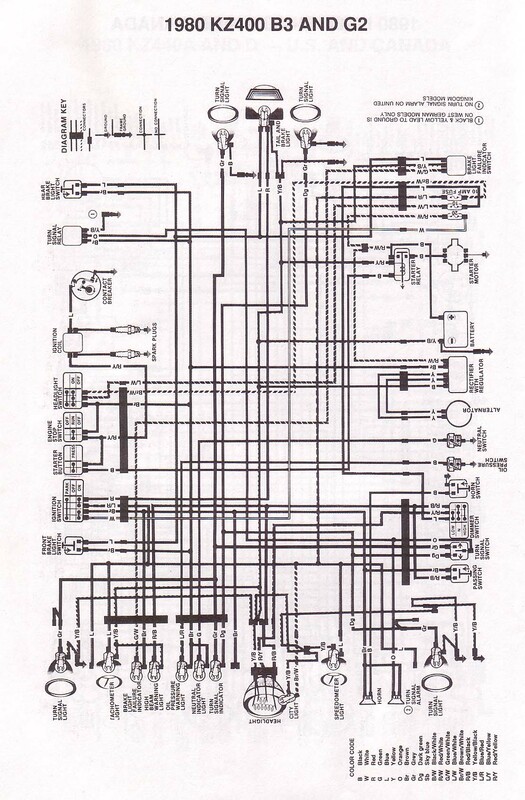 Go to "View parts diagram" and search for your bike. 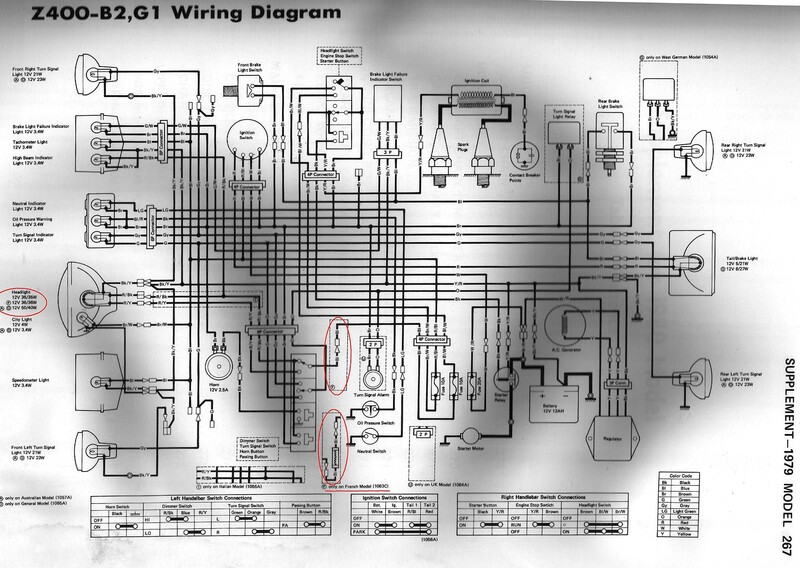 Just remember, if you have a KZ400 older than 1976, search for the 1976 model diagram any you will get diagrams for the 1974 and 1975 as well. An alternative would be converting to pod filters, but that will also involve re-jetting the carbs since the mixture will be leaner with pod filters. 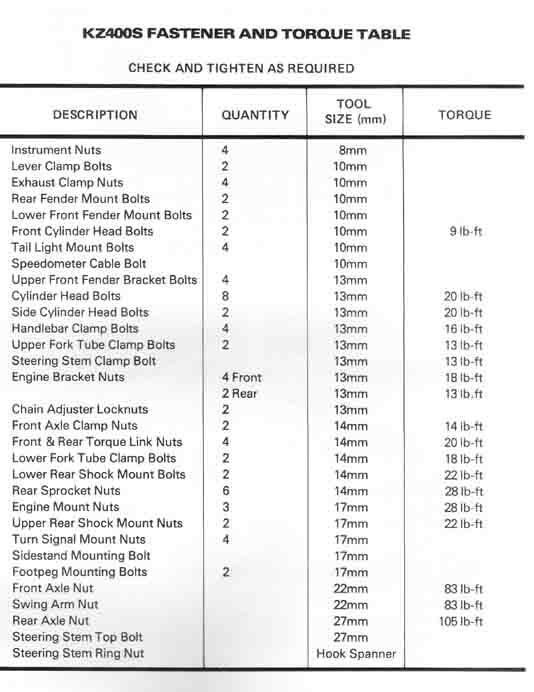 Jets for the carbs on the 1974 to 1976 models are not easy to find, but //www.bikebandit.com still have them listed. It is the main jet that needs to be increased. 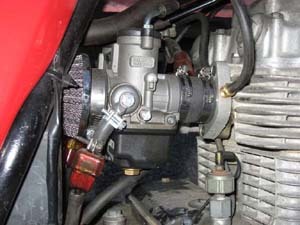 Another issue when converting to pod filters are the crankcase breather hose that goes in to the original air box. This can be routed backwards with a longer hose, or you can buy a breather filter which is the more expensive solution. Both KN and Emgo are producing pod and breather filters. 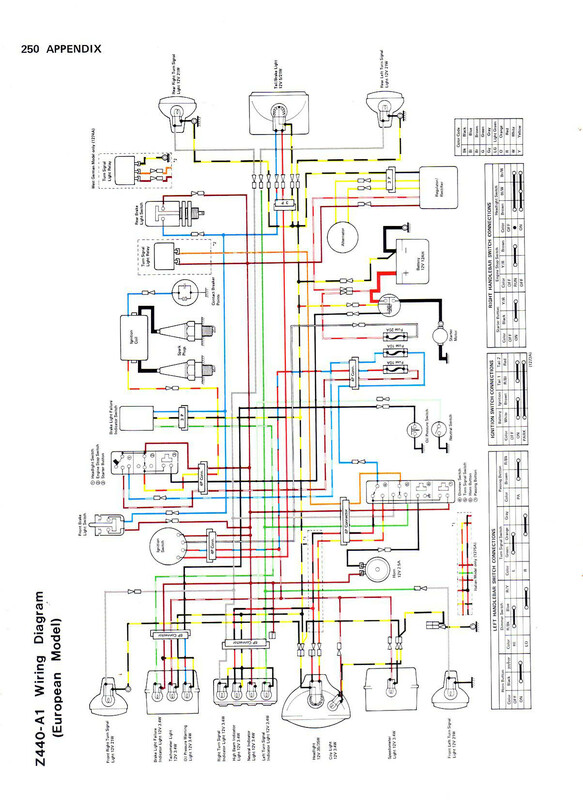 Reading the spark plugs can tell a lot about the engins state of tune and wear. Here you can see how it is done and you will also find colour images for comparison. 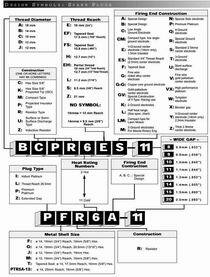 You can learn about the NGK spark plug codes here. The pipes and muffler units for the early models are rare to come by as NOS (Now Old Stock) parts. They have been up for sale once in a while on EBay, but the price gets high. BikeBandit have got a left side unit listed at a price of $481. 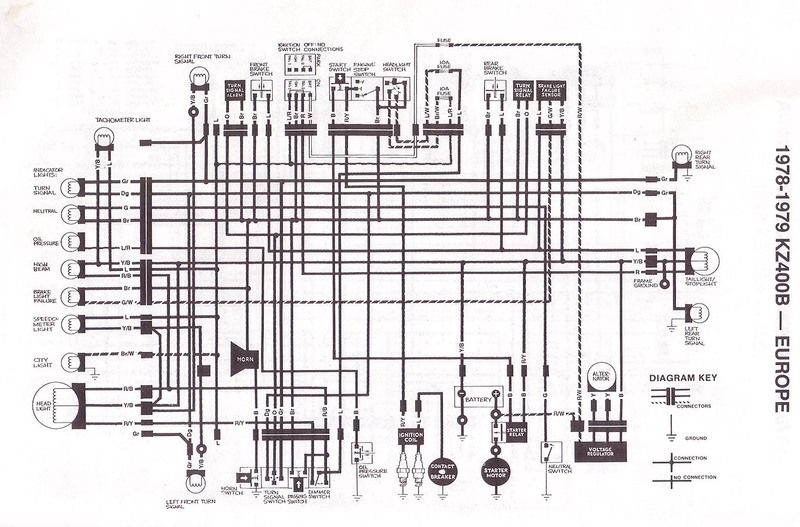 An option here will be to use an aftermarket system. Mac is producing both 2-1 and 2-2 aftermarket systems. There are also other producers that are making those. If the down pipes are useable there are also several aftermarket universal mufflers that can be used. 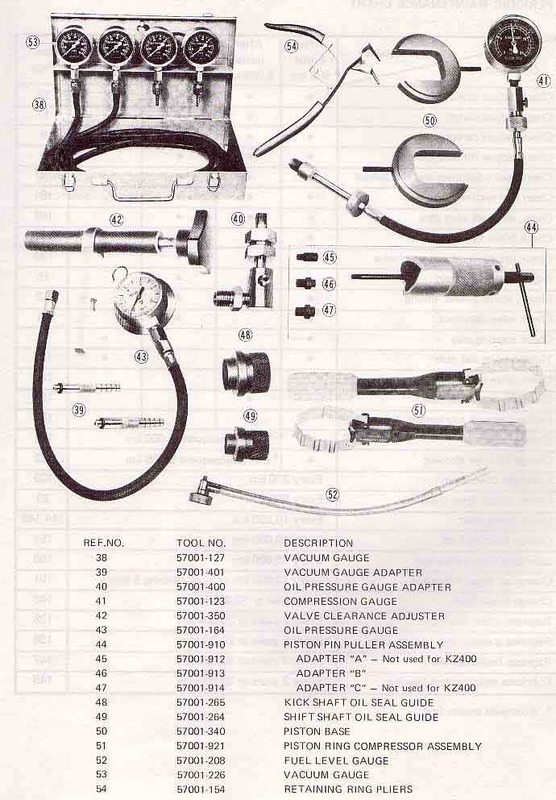 Many dealers have got aftermarket systems for the KZ400 listed. 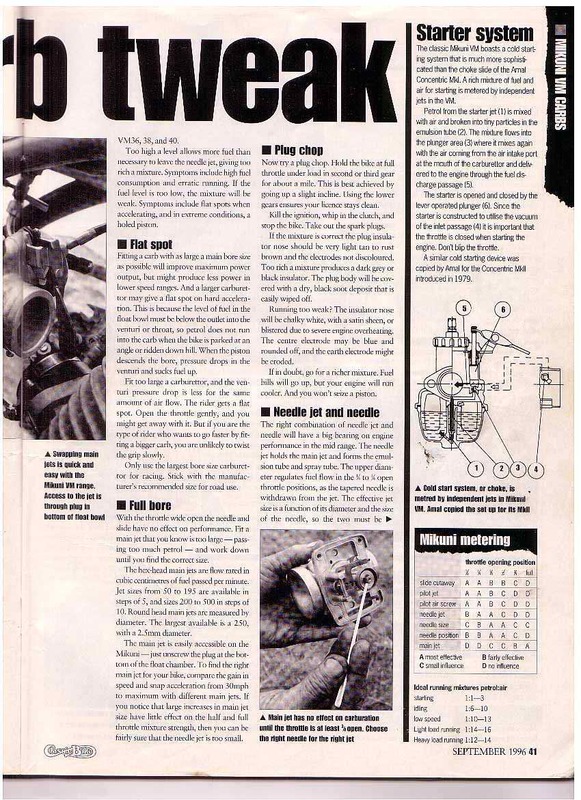 But again as with the pod filters, since some of the aftermarket systems are less restricted than the original system, it could involve re-jetting the carbs. When I polish the engine covers, I use Solvols Autosol. That is a very good chrome and aluminium polish. I always polish them by hand. And to preserve the finish, I polish them with Turtle Extreme car wax. If the covers are covered with oxide I use wet sanding on them, beginning with grade 400, then grade 600, grade 800 and finally grade 1000. I use a lot of water and try to sand as light as possible. And finally I polish them as described. You can see the result on the pictures at the top of the page. 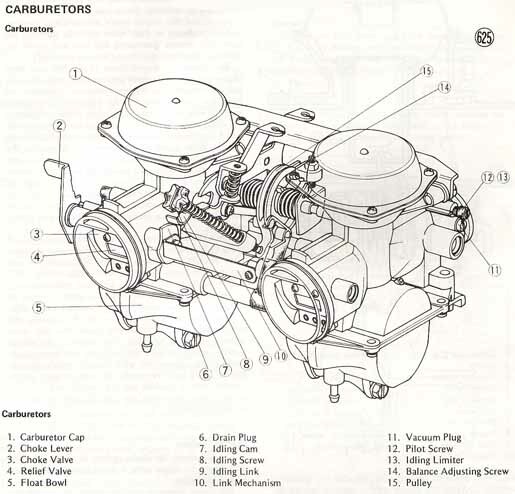 Remove the fuel tank, the spark plugs, the ignition timing cover from the right side of the engine, and remove the 4 valve adjusting caps. 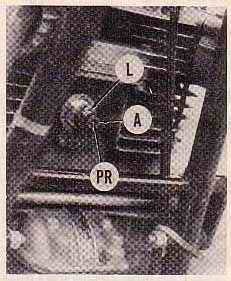 Then turn the engine counter clockwise with the 17mm nut on the end of the crankshaft. (Do not use the 13 mm bolt) Watch the right hand intake valve (the rear valve) moving down (opens) and up (close) as you do. When the valve are up (closed) continue to turn the crankshaft approx 1/4 turn until the T mark on the ignition advance mechanism aligns with the index pointer on the primary cover (located behind the advancer mechanism and the points plate/timing plate). Now you can measure the valve clearance on both the intake and exhaust valve on the right hand cylinder. 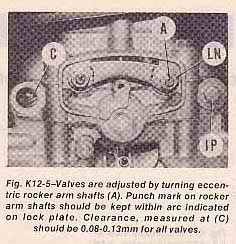 When the clearance is correct you will feel a slight drag when you insert and withdraw the feeler gauge between the rocker arm and the valve stem. 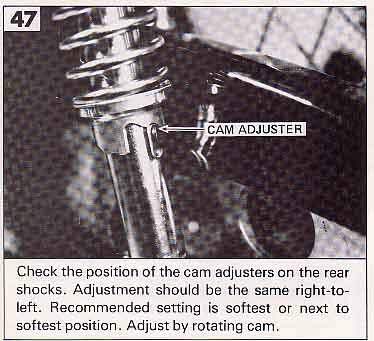 Adjust if necessary by loosing the locknut on the adjuster screw, and adjust the clearance with the adjuster screw. 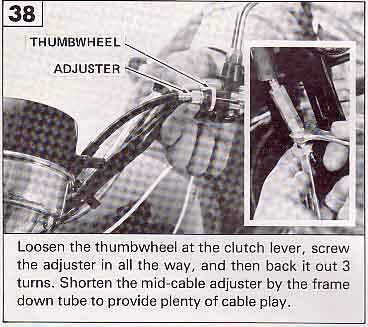 Be sure to hold the adjuster screw steady, and tighten the locknut securely when done. 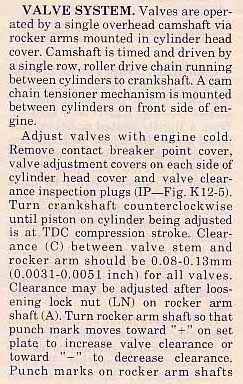 When you are done with the right side cylinder, turn the crankshaft one full round till the T mark aligns with the index mark again. 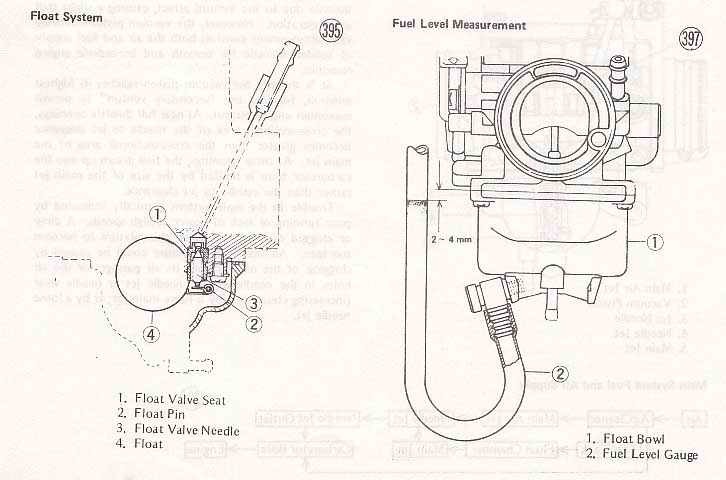 Now you can repeat this procedure on the valves on the left hand cylinder. 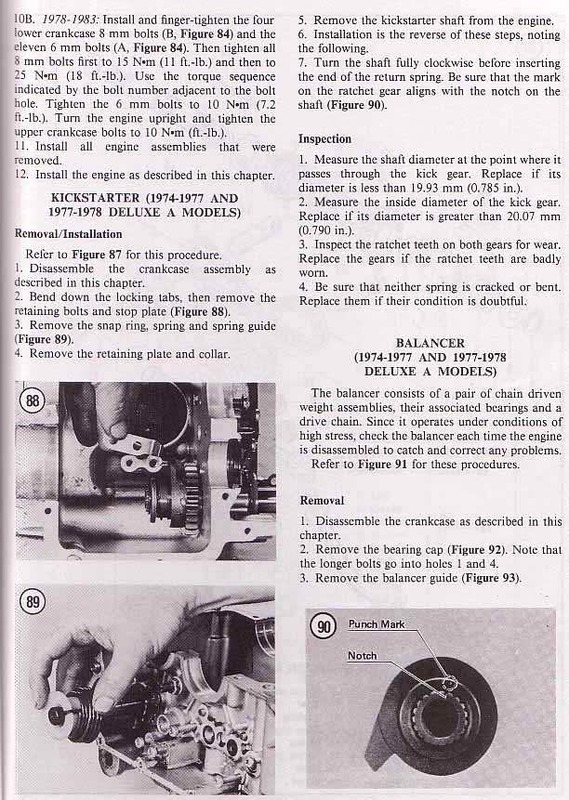 Note: This is the adjustment procedure for the 1974-1977 D and S engine release mechanism. 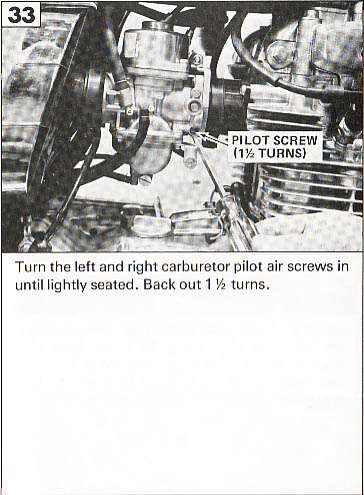 For the 1978 and on engines with the release mechanism on the left hand side, turn the screw in till it is loose, then turn it out till you can feel a resistance, and then 1/4 turn in again, and fasten the lock nut. The cable free play should be adjusted the same way as for the early models. Many models share the same brake pads and brake shoes. 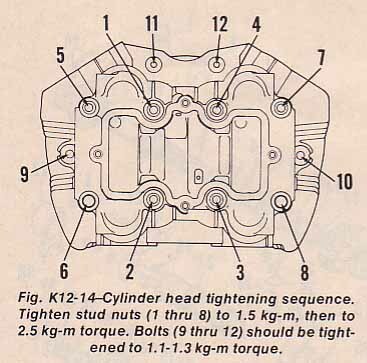 Also the KH250, KH400 and S3 triples used the same brake shoes as the 1974 to 1977 KZ400. 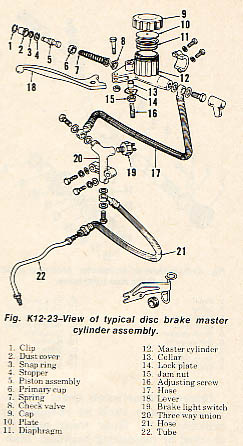 And all the KZ400/440 with a front drum brake shears the same brake shoes. 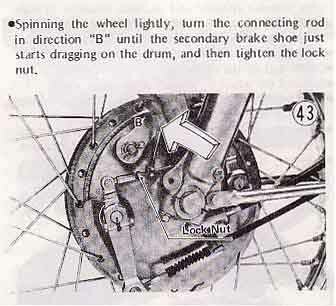 The rear brake shoes are the same between 1974 and 1977. 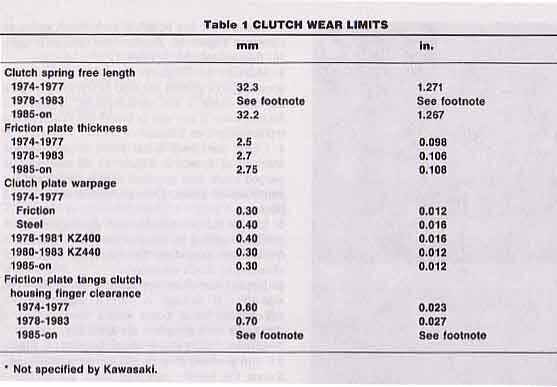 And the 1978 rear brake shoes were used all the way up to 1983. The brake pads are the same for the 1974 and 1975 models. The 1976 and 1977 models and the 1978 A2 models used the same pads. Then a new type was used on the 1978 and 1979 models. 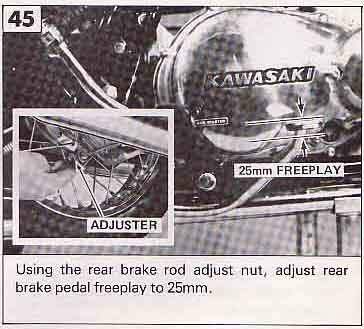 Then with the 440 models in 1980 there was used a third type of brake pads. 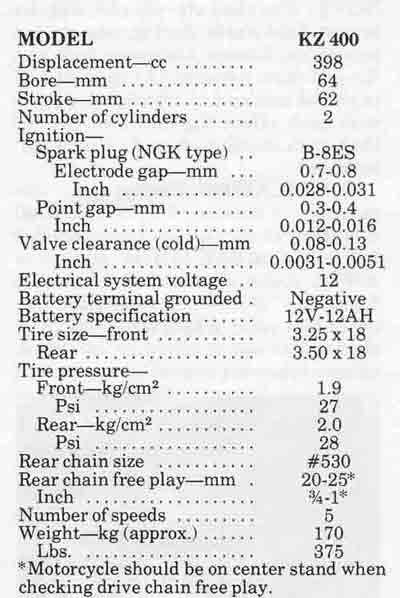 Most of the 440 models used this type. 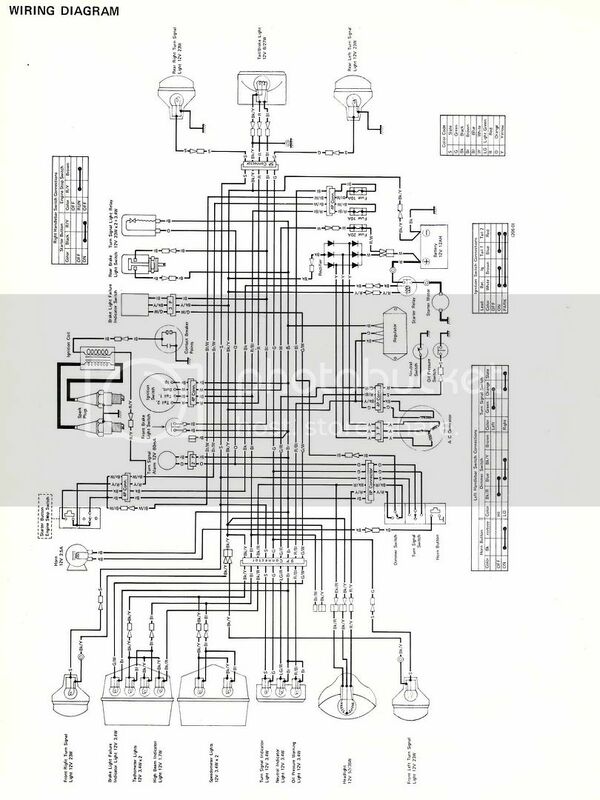 It was only the 440 A5 that had a fourth type of brake pads. And this also points out that there will be several types of brake callipers used on the 400/440 models. 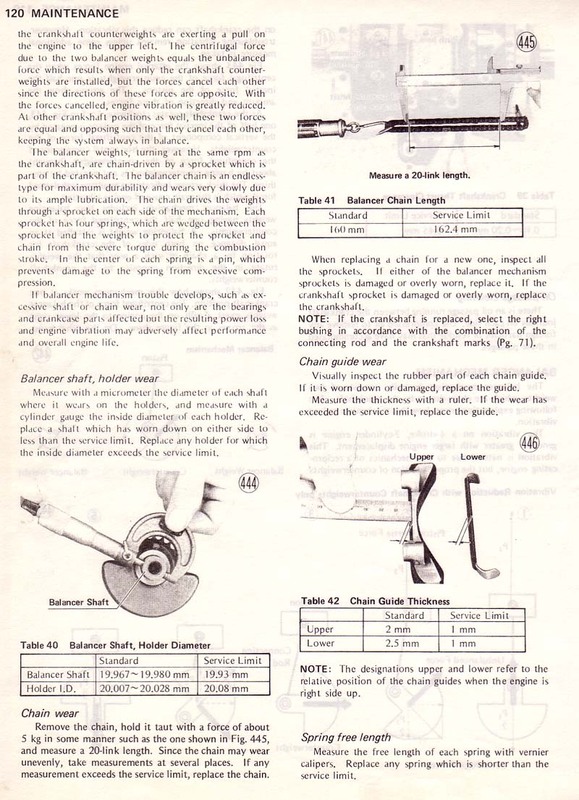 On the 1974-1977 models there were tow different callipers used. 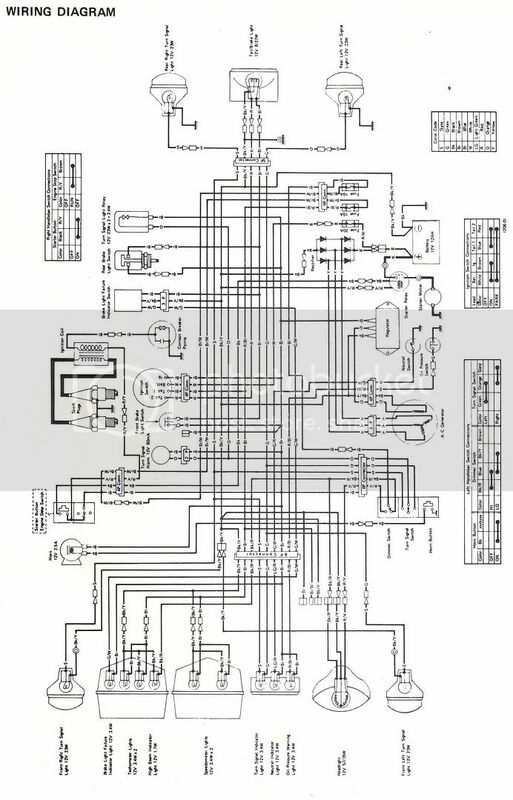 You will find a diagram of both below. However, there is no way to tell which calliper that was used on which bikes. The brake pads are the same, but the way they are mounted to the calliper is different between the two. 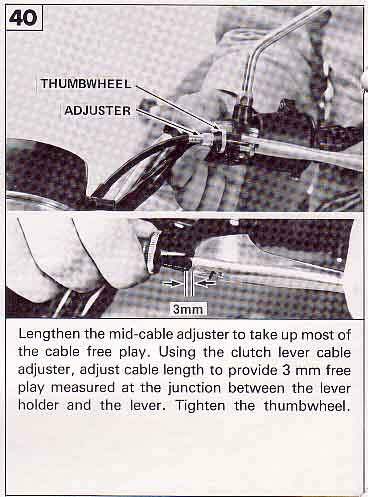 If the adjustment range is entirely used up at the throttle grip, use the adjusters at the carburettor end of the cables to create slack in the cables. 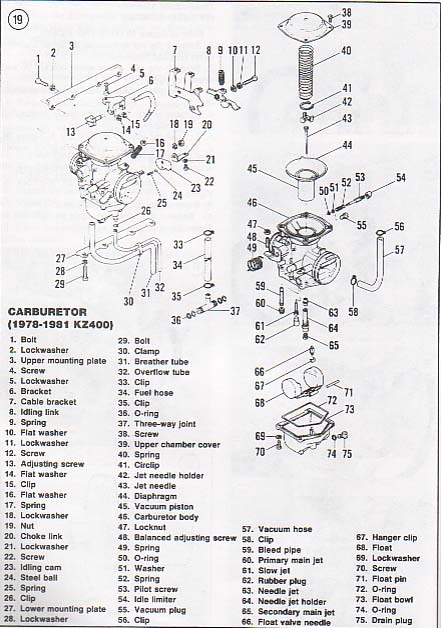 And the complete list for the 1974-1979 KZ400 carbs can be found here. 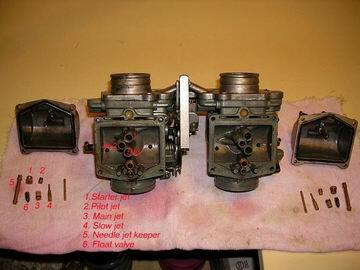 About jetting and adjusting carbs. 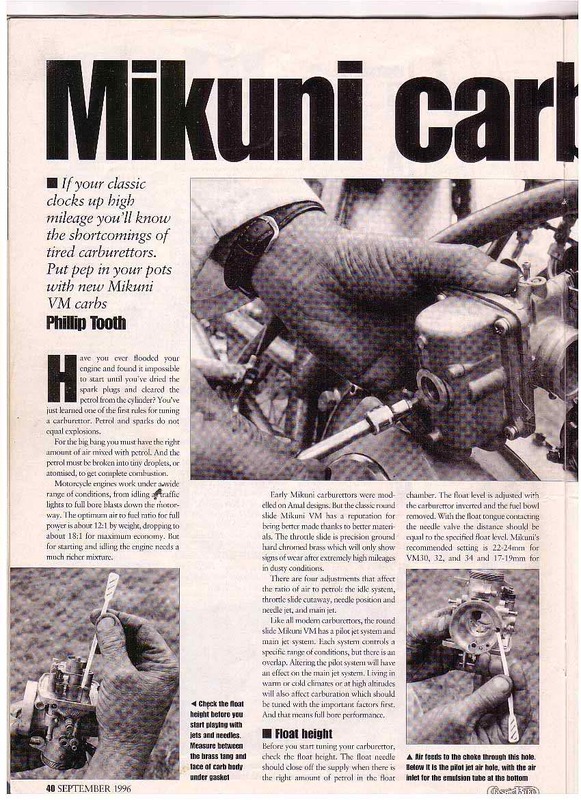 This is written for the Mikuni slide carbs, but many of the tips can be used for the CV carbs as well. 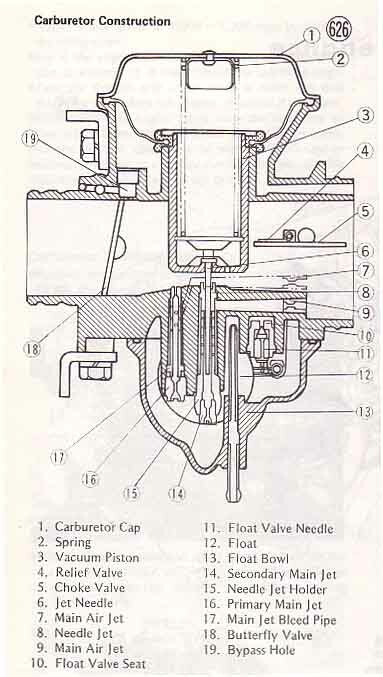 Many of the questions I have seen regarding poor running are related to the carburettors. 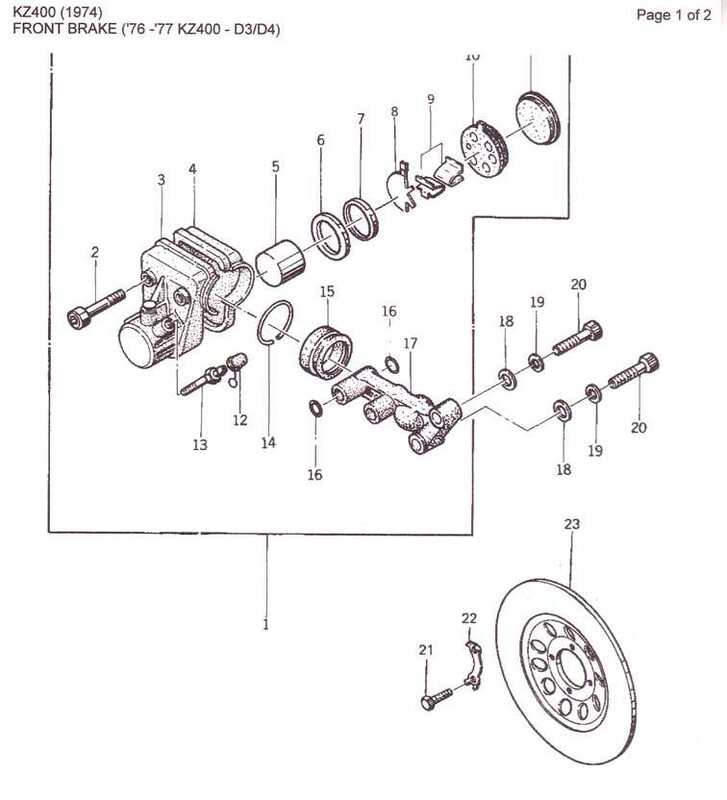 Cracked diaphragms, clogged jets, fuel level adjustment, clogged fuel lines and balancing are the most common problems. And the jetting problem when pod air filters and/or aftermarket exhaust are installed. Before any carb adjustments are done, the ignition and the valve clearances should be adjusted, and the spark plugs should be cleaned or replaced. 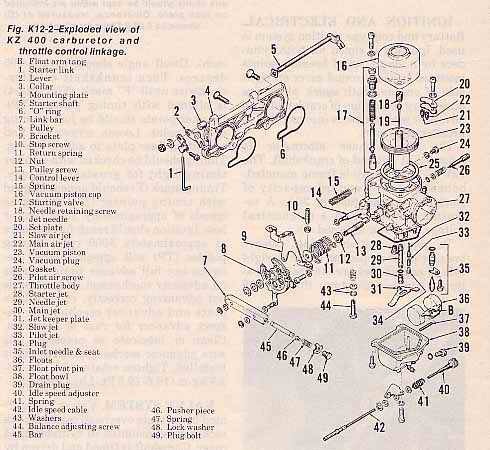 And on the 1974-1976 carbs you should also check that the o-rings on the main jets and the rubber plug covering the pilot/slow jets are making a sufficient seal. 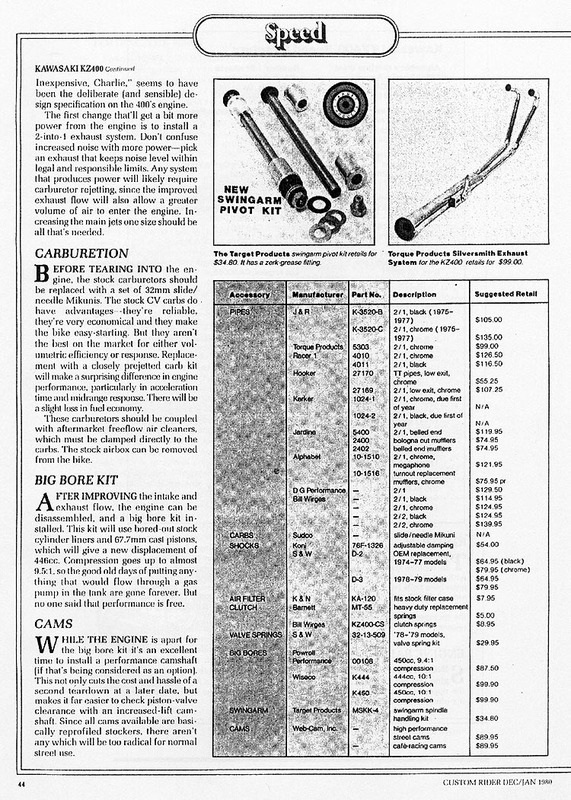 A tip about the vacuum pistons in the 1974 -1976 carbs. 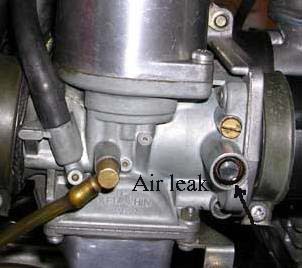 To make a better seal between the piston and the cap, smear a thin layer with synthetic two stroke oil on the grooved part of the piston (the red arrow on the picture). Just be careful and don’t use too much. Put the pistons in to the caps and move them up and down. Then take them out and dry off the excessive oil. 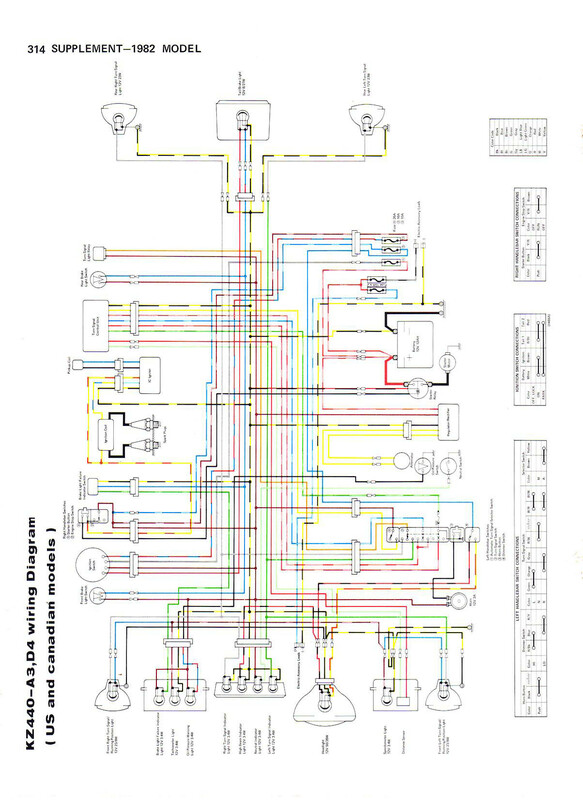 There is also one more thing that can be a problem with the 1974 - 1976 carbs. You can get an air leak when the bushing for the butterfly valve shaft gets worn. 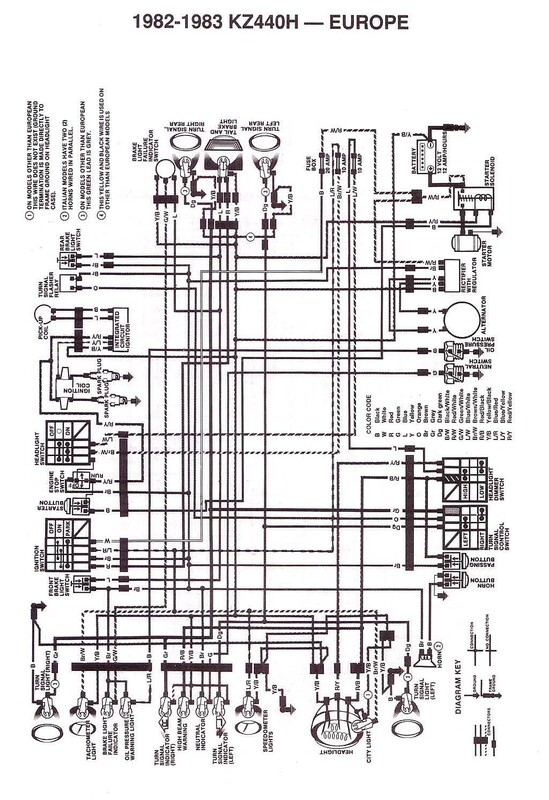 This will make it difficult to adjust the idle mixture, and balancing the carbs. If the bushing is badly worn, it should be possible to fabricate new bushings for the shaft that will provide a better sealing. On the second picture I have made a temporarily seal out a piece of plastic that I have glued on to the edge of the carb body outside the shaft. 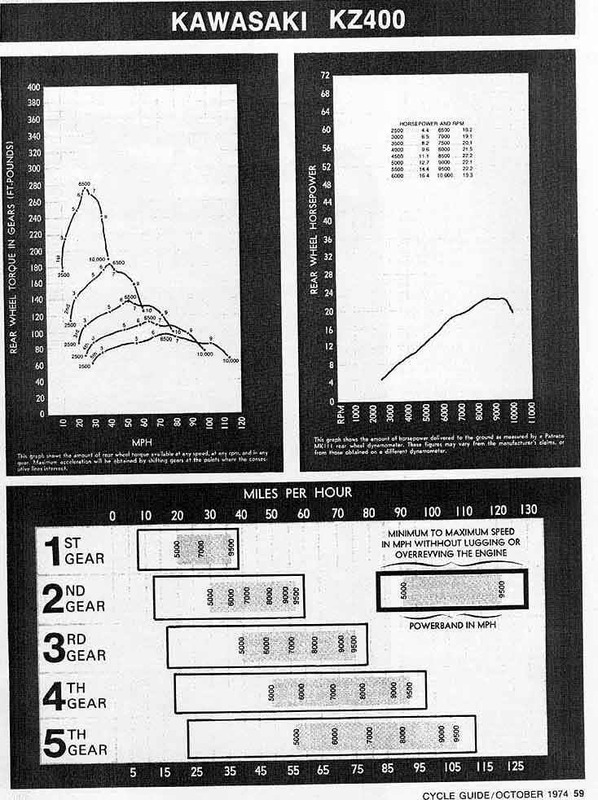 I have done this for a test only, and there was a small improvement in the low rpm area. 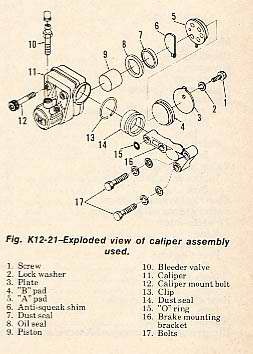 But if the butterfly shaft is worn, it will also leak on the inner side of the carbs, and it is very difficult to fix that leak in an easy way, so it's hard to tell if there is much to gain all in all. This is the rubber caps that are covering the pilot jets. They are no longer available, but I have bought caps for Suzuki GS 1100 carbs and trimmed them till they fit with a hobby file. And you will find more details about the 400 carbs here. 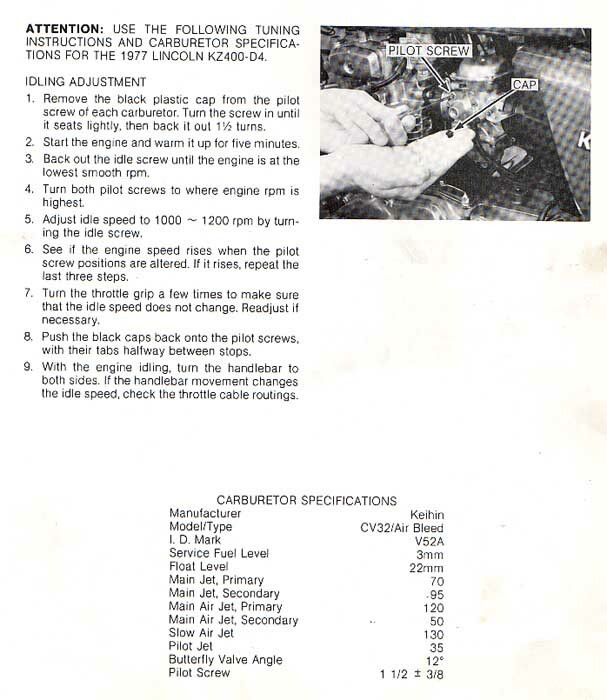 1978-1979 Z400B1, B2 ,G and H(LTD) jetting list and ajustment specs. 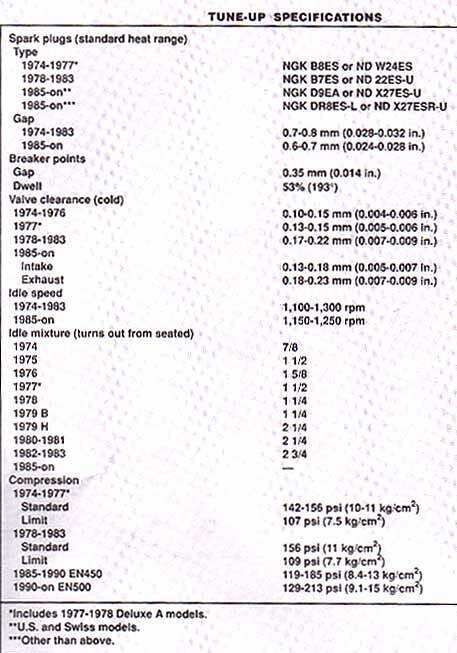 1978-1979 KZ400 B1, B2, C and H1 (LTD) jetting list and adjustments specs. 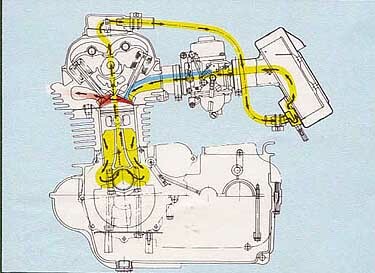 I would also recommend fitting fuel filters on the fuel lines between the petcock and the carbs. That will save you for a lot of carb trouble. And drain the float bowls at every service. And I check and readjust the idle mixture at every service. I also balance the carbs from time to time. It secures a smooth running and will reduce rattling from the primary chain at idle. A carb balancing tool is expensive to buy but will last for many years. I have bought a Morgan Carbtuner and I have never regretted the investment. It is very easy to use. And you can really feel the difference when the carbs are balanced. You will find some pictures of the process here. 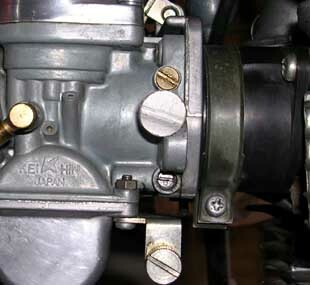 More about motorcycle carbs here. And there are more links to sites about carbs here. Here you will find some tip about carb cleaning. 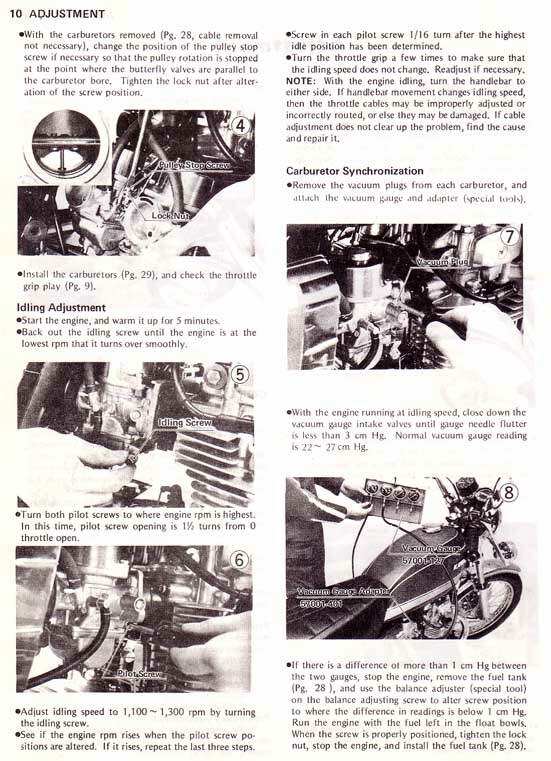 And here is an instruction with pictures about how to balance the carbs for the 1974-1976 D and S models, and the 1977 A1. I got a unique chance to find out how these bikes really ran when they were new this summer (2006). This spring I purchased a set of brand new 75 model carbs from a guy in England. They came with the stock factory jetting, and had never been installed on a bike before. I installed them on an engine with only 5000 miles after a re-bore, and a valve job and with a measured compression of 152~153psi on each cylinder (stock is 142~156psi with a service limit of 110psi), so it was close to having a new bike. With a stock air filter the average mileage is 62~63mpg and at its best 68mpg. 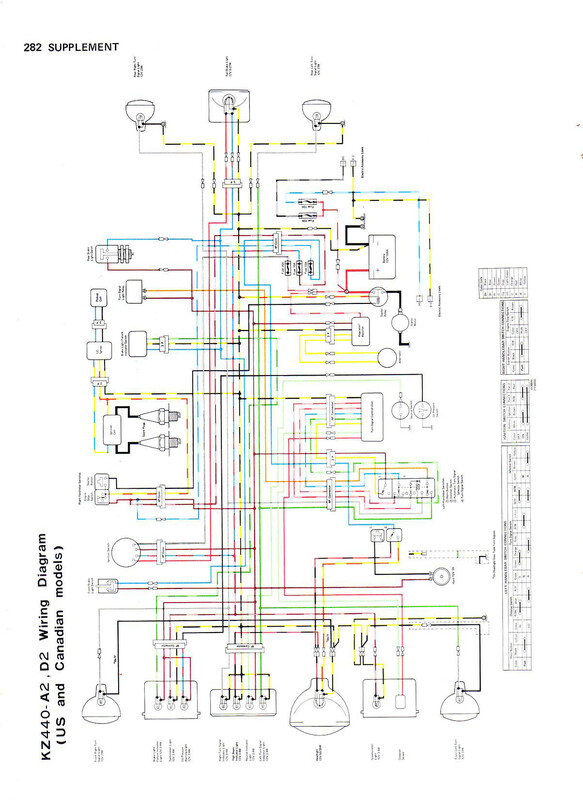 When that is said, I have also had an aftermarket electronic ignition system that does improve the gas mileage a little. 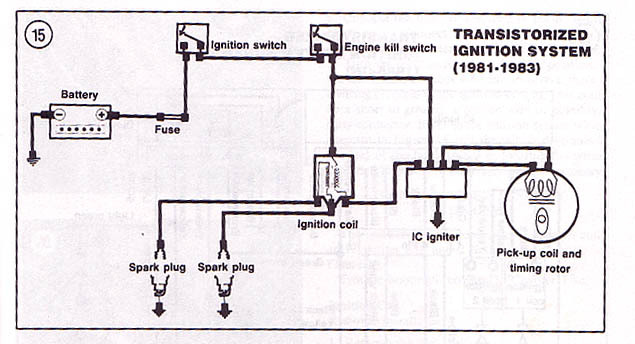 The improvement is approx 8~10% compared to a points ignition system. Power is good and there are no running problems, but the engine is cold blooded and needs to get warm before it pulls well in the mid range. I also tried to run it without the air filter installed just as a test, and I got a huge flat spot in the lower and the mid range rpm area. 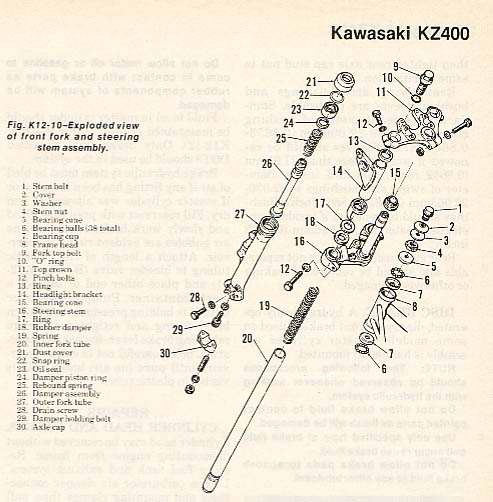 This is the original Kawasaki fuel level gauge. 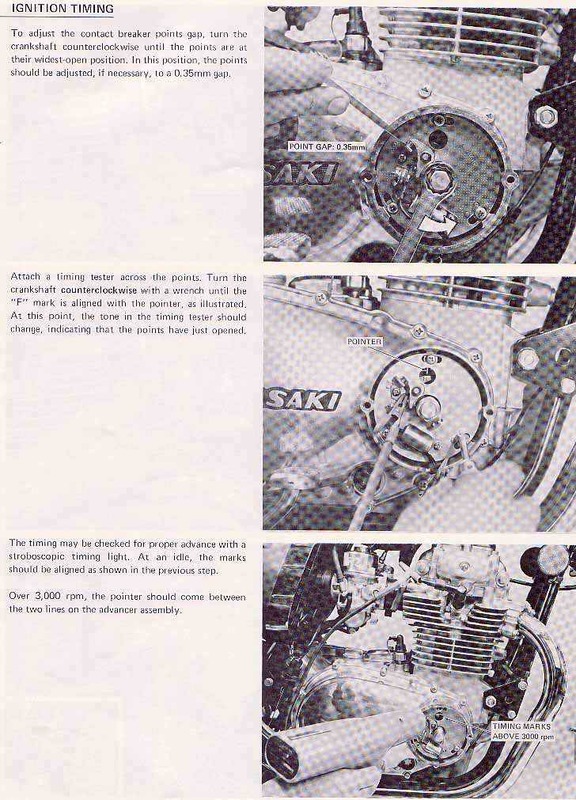 I got this tip from a Norwegian Z400 owner, Inge Serigstad, who owns a 1981 Z400. He has bought two Dell’Orto PHBH 30mm and fitted to his bike. He told me they are working very well. 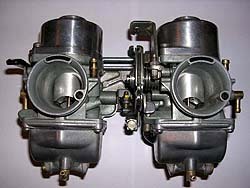 These carbs are originally for the Moto Guzzi V65, and there is one right hand and left hand carb. He has fabricated metal intake manifolds with short pipe stubs in aluminium, and has used 35mm radiator hoses as intake rubbers. I haven’t gotten the list about what jets sizes he is running, but I will post it as soon as I get it. On the pictures you can see a hose connected to the intake manifold. 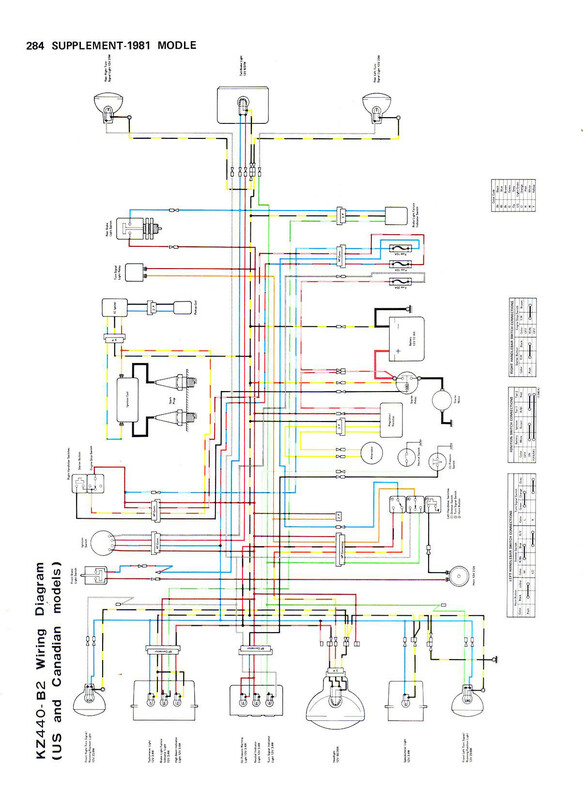 He has one at each manifold and they are connected to two small vacuum gauges installed on the bike. That way he can always see if the carbs are synched properly. And this company will set up the carbs with jets and jet needles siutable for the Z/KZ400. 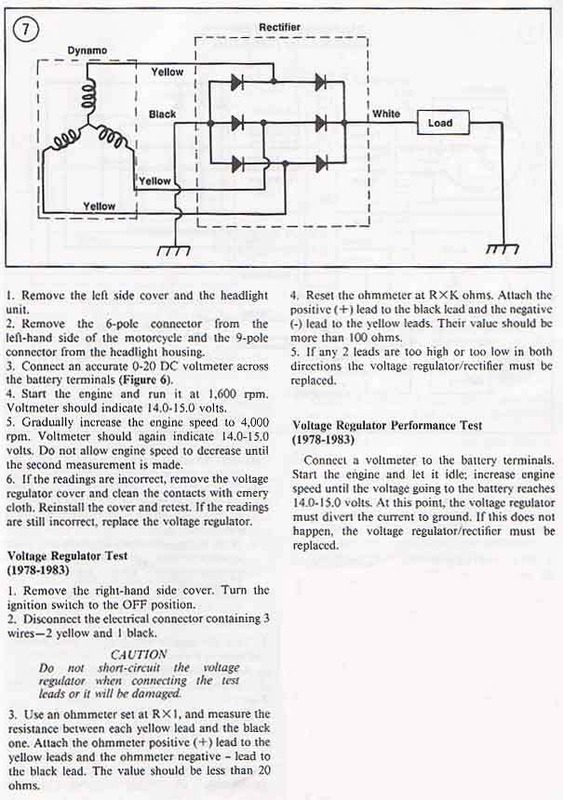 When you do a compression test with a compression tester, the throttle should be fully open. 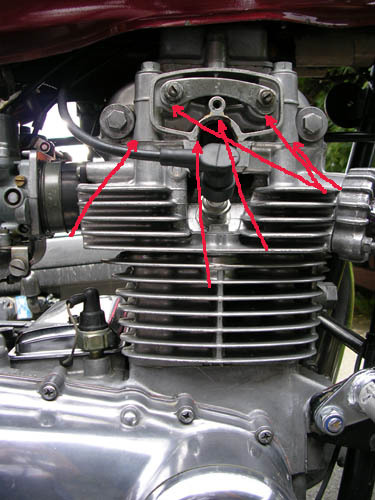 And if there is a difference between the cylinders that is more than 10%, there is a problem with leaking valves or leaking piston rings on the cylinder with the lowest reading. 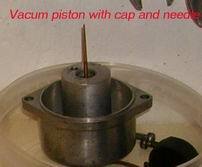 Pour a teaspoon with engine oil in to the spark plug hole on that cylinder and make a new test. 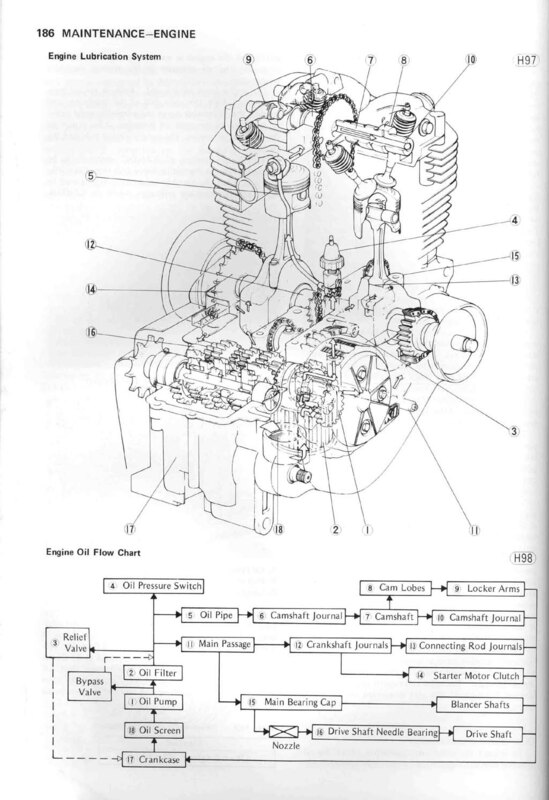 If the reading increases there is a piston ring problem. If it remains the same it is a valve problem. 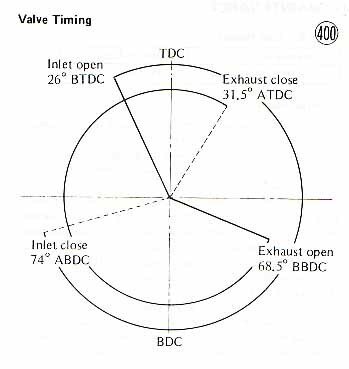 A compression test should be made at every tune up and recorded. That way it is easy to see if there is a sudden drop in the compression, and the problem can be corrected. 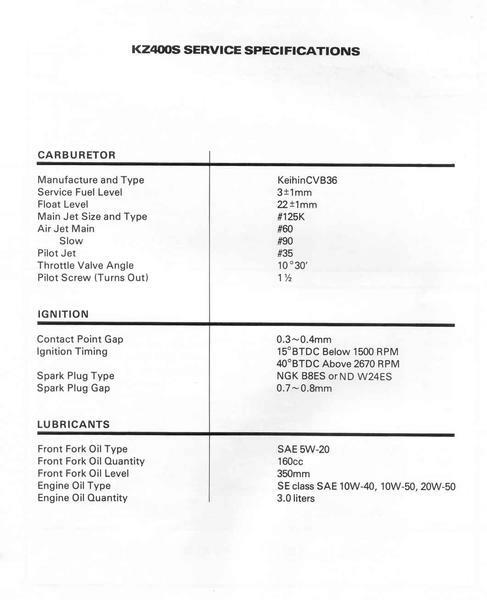 The compression specifications and the service limits are found under Tune up specifications on the top of this page. Picture 11. 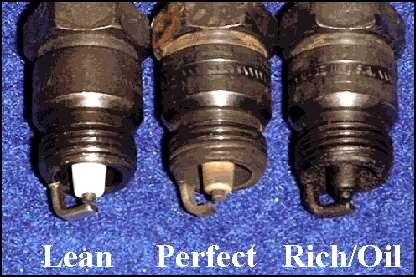 Reading spark plugs is the best method to measure proper main jet selection. Proper detection of correct jetting keeps potential problems from occurring well in advance of the damaging results that could take place. 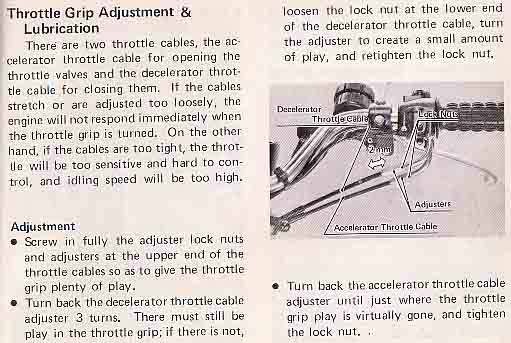 Reading plugs should only be done by doing a "Throttle Chop" (a hard wide open throttle run followed immediately and simultaneously by killing the ignition, pulling in the clutch, and closing the throttle, coasting to a stop and pulling the plugs out for inspection). The plug on the left indicates an overly lean condition, although it looks brand new. Further symptoms would include slight specs appearing on the surfaces indicating pre-ignition. The centre plug shows near perfect running condition of a light ash colouring on the porcelain which is a normal result of burning gasoline. The plug on the right shows excessive oil burning (black gritty surface) and overly rich fuel mixture (black, smooth shiny surfaces). 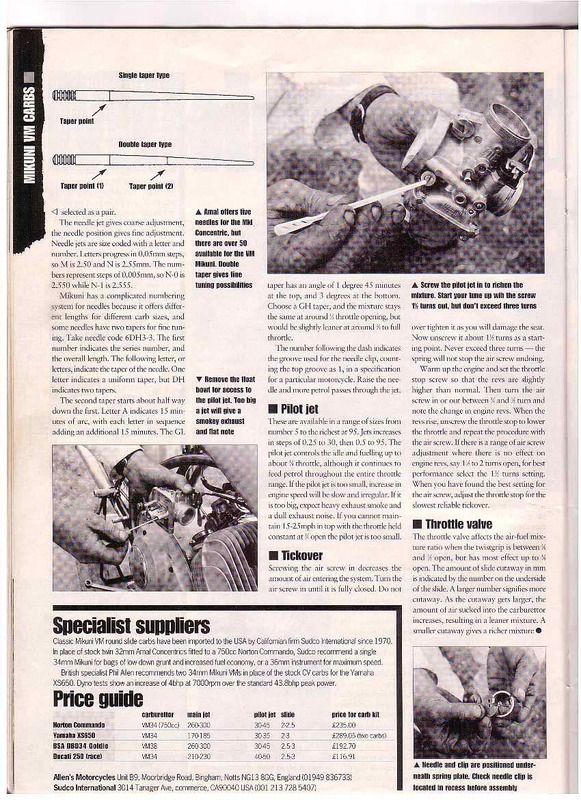 More about reading spark plugs here. 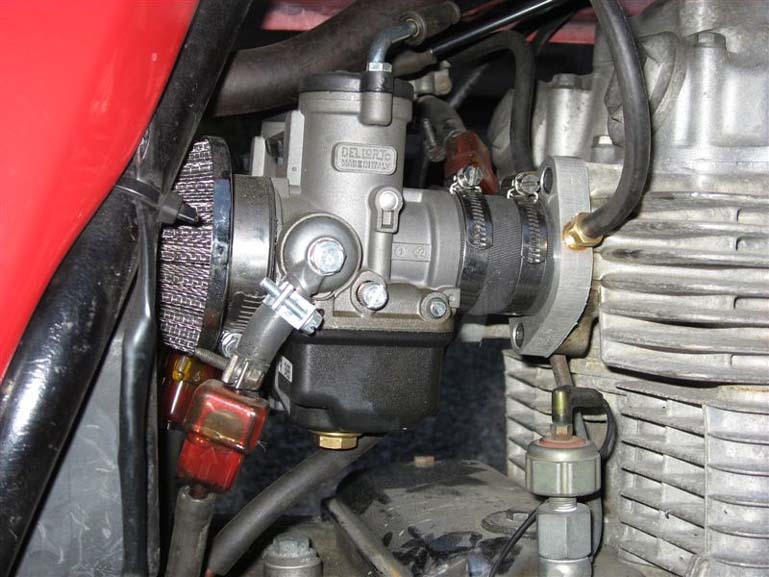 I have fitted an electronic ignition system on my 400. It is a Boyer Brandsen Mark 3 system. I bought this the year after I bought the bike, and I bought it from a Norwegian parts supplier who had this one unit in his stock. I have had this on my bike since it was bought in 1997 and it has always worked great. You can read the fitting instruction here. 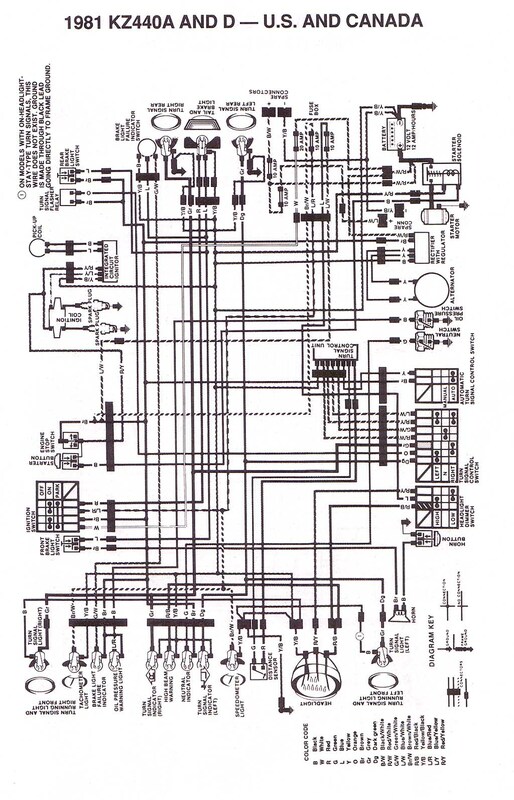 And Boyer Electronics can be contacted here. 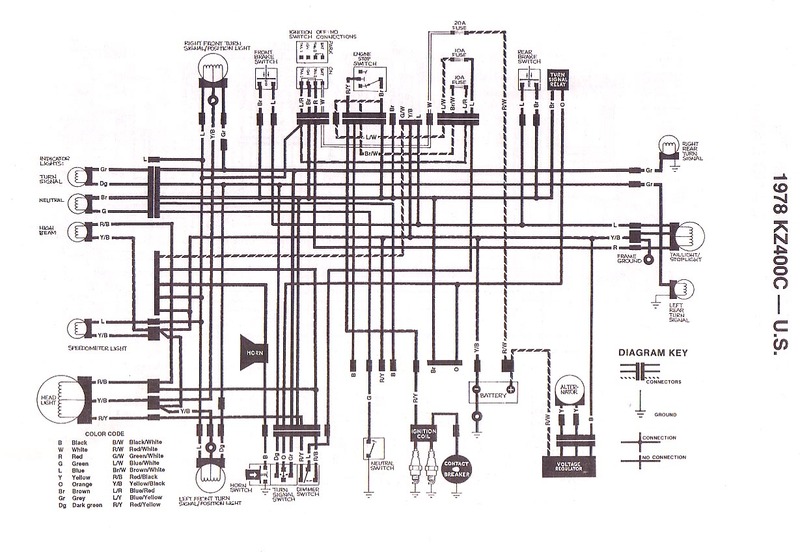 This is the system I have on my 400. 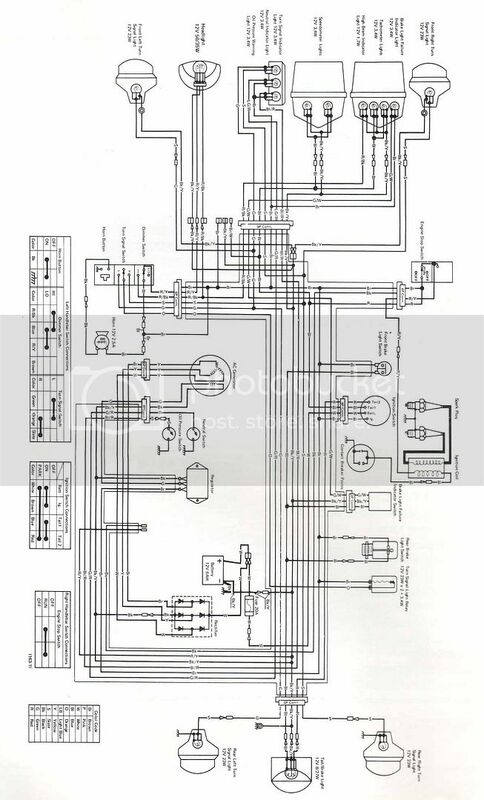 There is also another producer that are making an electronic ignition system for the KZ400: Newtronics. 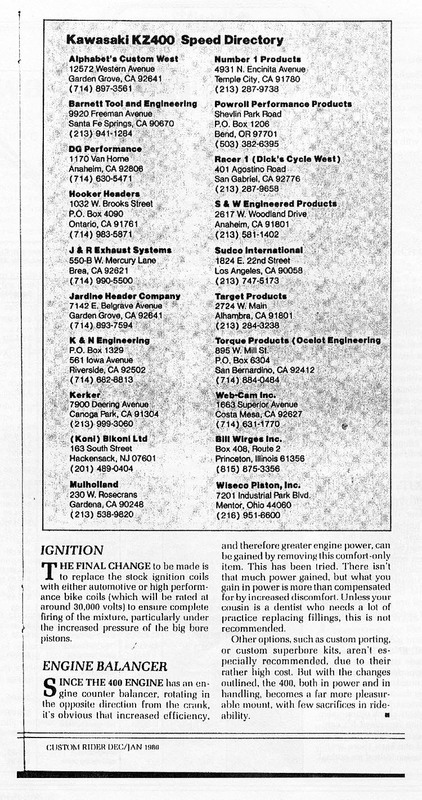 And there are KZ400 owners that have fitted the electronic ignition system from the 1981 - 1984 models to older 400's with success. Details about it can be found here. 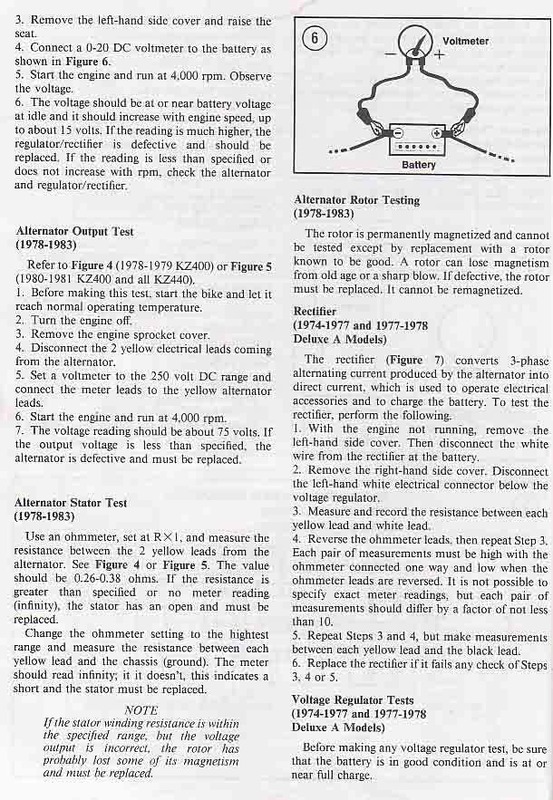 On the 1974 to 1977 models you can use the voltage regulator from the 1976-1977 KZ650 models (before the B2). 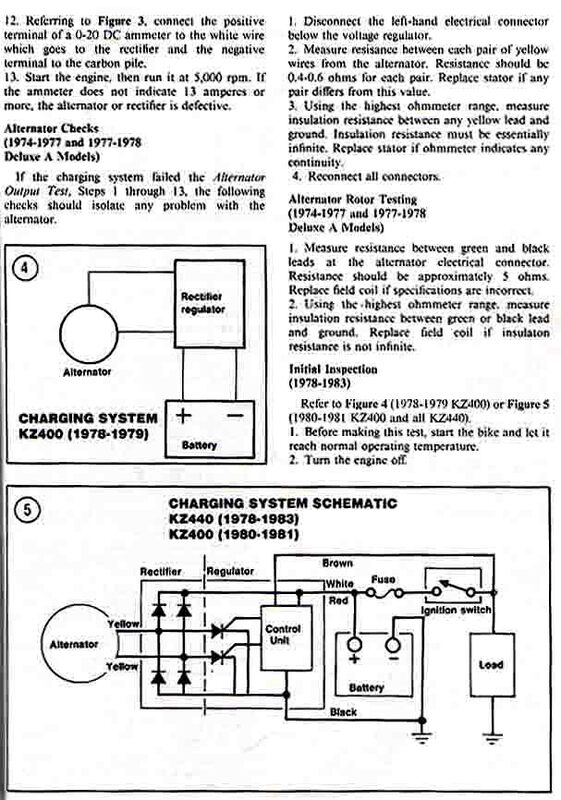 On the 1978 and 1979 models you can use the regulator/rectifier unit from the 1978-1979 KZ650 (B2 and after). 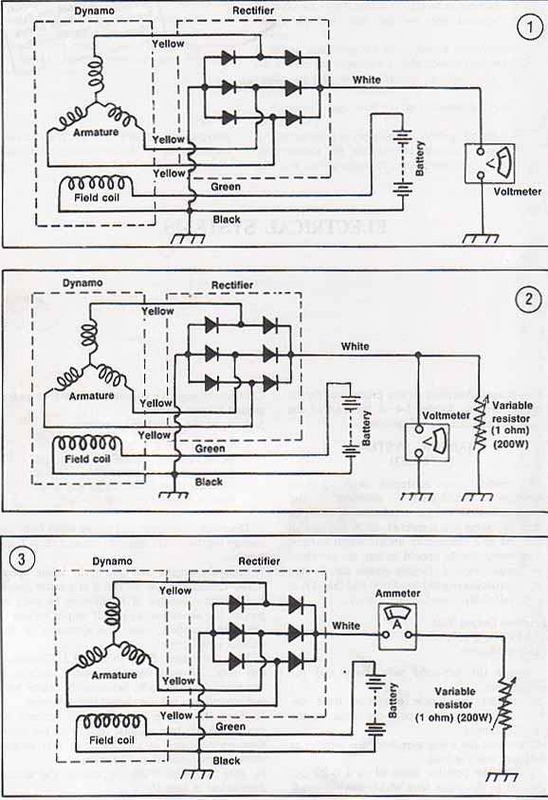 There is also a company in USA that is building cheap replacement rectifiers, regulators and regulator/rectifier units. This is their website. I have also fitted a main light switch to my bike. I found that sometimes it is an advantage that you can turn on the ignition without turning the headlight on. I have done this very simple by putting the switch on the earth wire to the head light. I have used a very small switch that I have fitted in to the panel next to the ignition lock. If anyone wants to fit an oil cooler to their KZ400/440 you can check it out here. 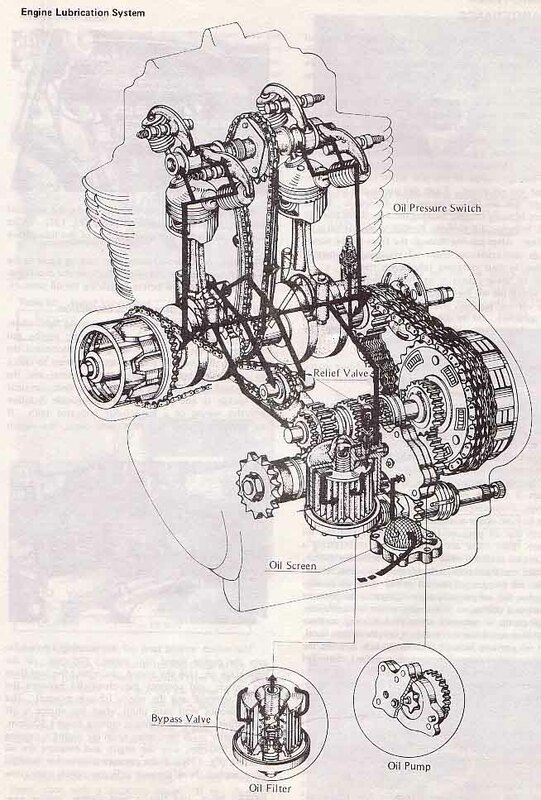 The 1974 to 1977 models was known to leak oil from the top end. 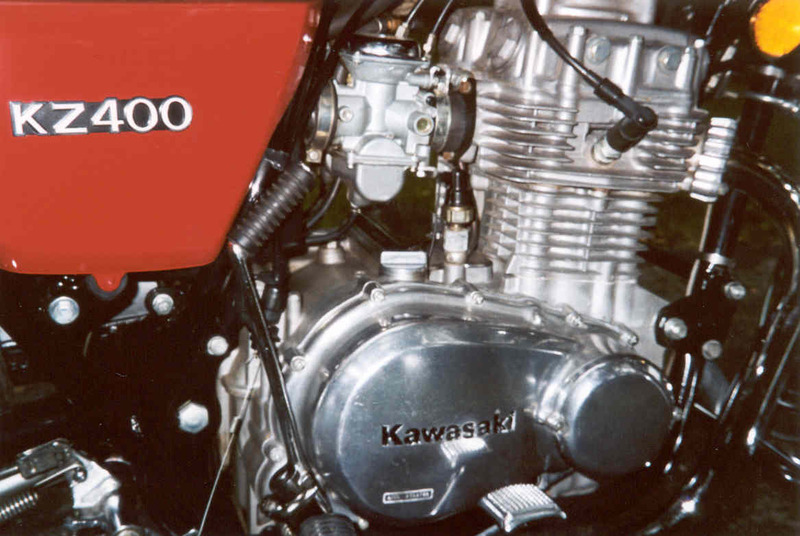 This was a problem that Kawasaki solved for their customers by replacing all the gaskets and o-rings in the top end, and they also replaced the cylinder studs at the same time. 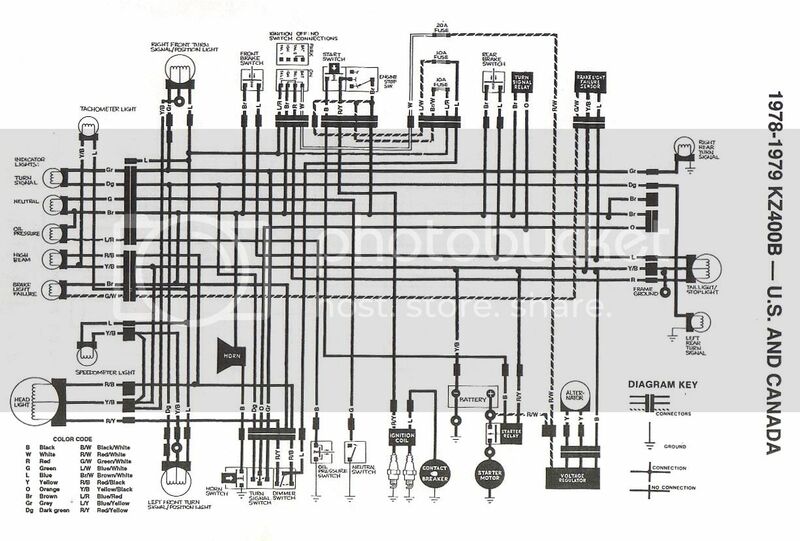 I have got one of those kits in my spare part shelf, but I have not had any use for it yet. I have dismantled the top end on both my engines and when I install the cylinder head cover, I smear a thin layer with blue silicone instant gasket on all the stud o-rings and on the head cover o-ring. This should make the top end fairly oil tight. If you do this, be careful not and don't use too much silicone. If you overdo the amount of silicone, the excess on the inside of the cover could work loose and clog up the oil ways. Replacing the o-rings for the rocker arm shafts, 1974-1977 engines. 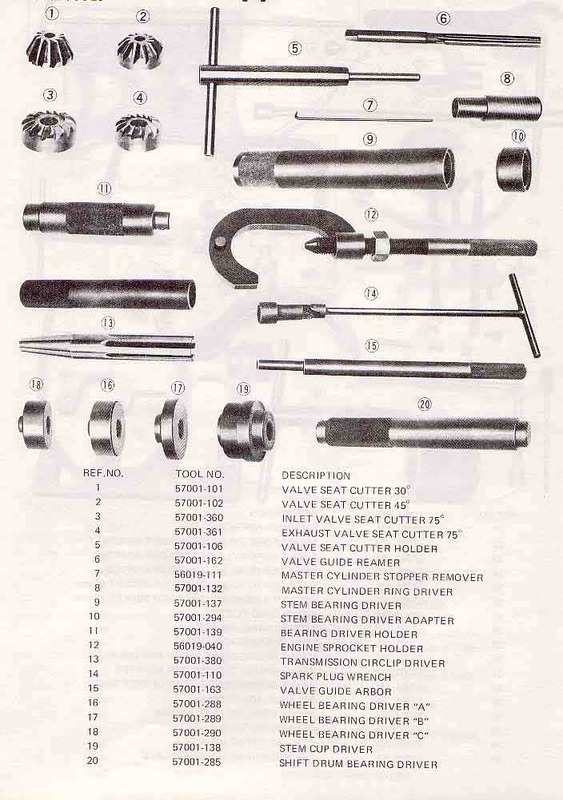 The o-rings for the rocker arm shafts are prone to leak on the 1974 to 1977 models. If you need to replace them you can either take the rocker cover off, or as I have done, replace them without taking the cover off. 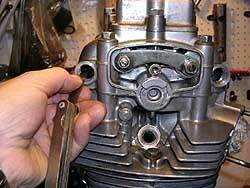 You must remove the valve adjustment covers, the adjustment locknuts and the plates. 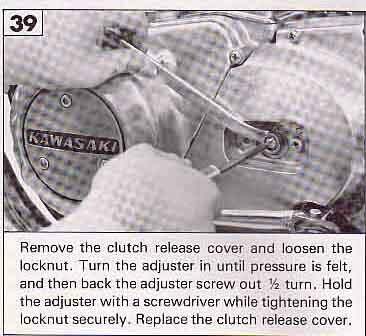 Then screw the locknuts loose on the shafts and wrap a piece of cloth around the nut and use a pair if pliers and pull the shaft out. Replace the o-rings and push the shafts back in position. If you are careful, there is no problem to make them entering the rocker arms inside the rocker cover. When you adjust the valves afterwards, remember to position the shafts with the punch mark on the end of the screw facing inwards, against the +/- marking on the plates. I did break one of my cylinder studs once, but I was able to work it loose by grinding it and grab it with a pair of pliers. 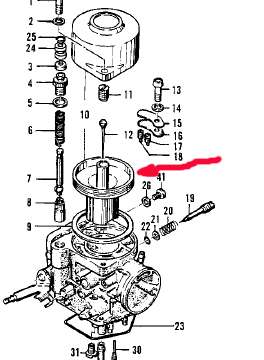 After that i found a tip that might be better because the stud that are left in the crankcase are normally fixed with liquid thread lock and are hard to get out. This is the tip: Put a washer on the stud that are left in the crankcase and weld it to top of the stud, then weld a nut to the washer, and you should be able to loosen the stud with a wrench and unscrew it. I have not tried this myself. So I can't tell if this will actually work. 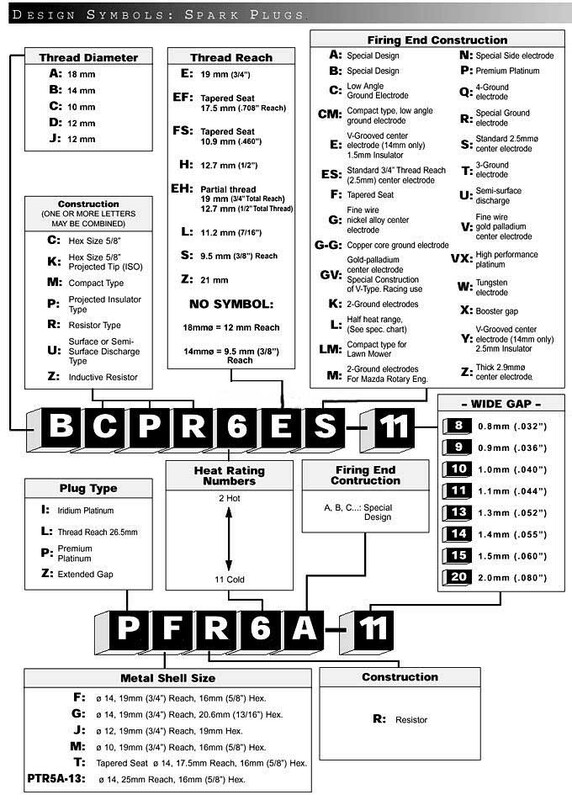 For those who would like to produce their own gaskets, there is a very good guide here. I replaced the seat cover on my 1975 modell in the summer 2003. It is not difficult, but take your time and be careful not to stretch it to much, you can see a result of that on the picture taken of my bike back in 1997. The hump on the rear end of the seat will be deformed. That is one of the reasons why I replaced it again. I bought my seat cover at BitzForBikes in UK. The prosess is described here. 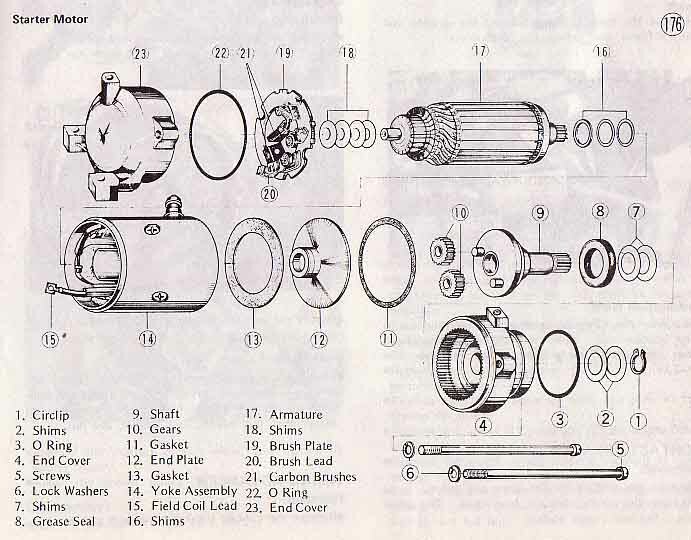 All the KZ400 and KZ440 models from 1974 to 1983 shear the same starter motor as a unit, but the later starter motors have got 4 carbon brushes, the early models have got 2. 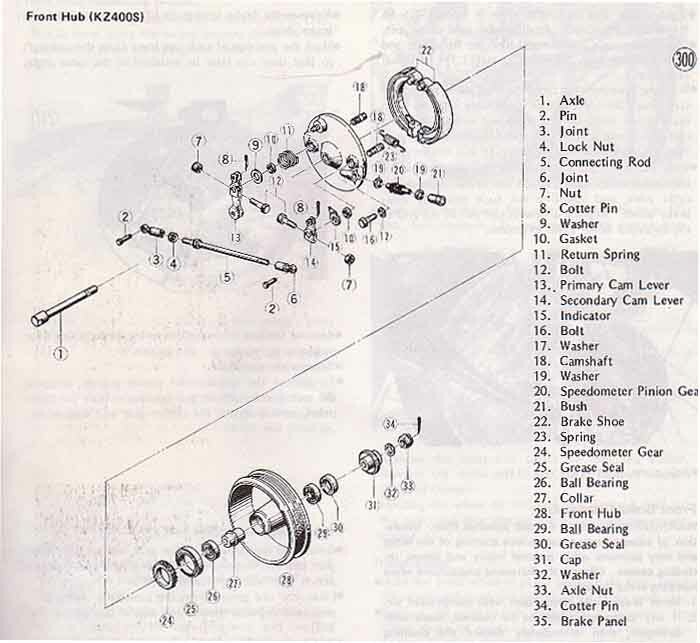 Here you will find an instruction about how to replace wheel bearings. 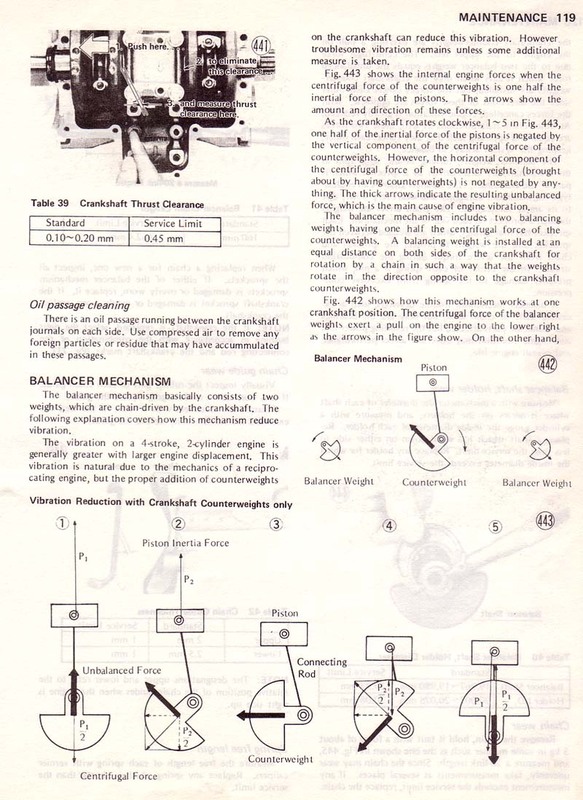 And you will find more info about the coding of the bearings here. 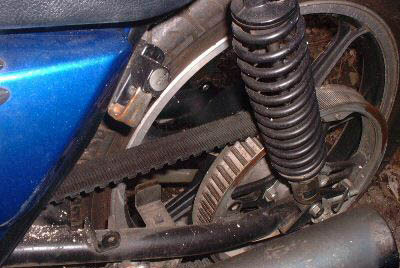 A fellow member on the KZrider forum came up with a gret tip about repairing the rear wheel cush drive/shock dampers. You will find it here. I have replaced the chain and sprockets twice since I bought the bike in 1996. 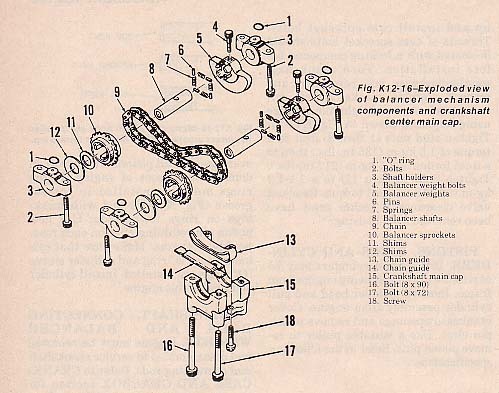 Both times I have used JT sprockets and a EK 530 KVD-O, o-ring chain. That is a chain with a riveted master link. The first set of chain and sprockets lasted for 24000 miles. I lubricate the chain at least every 150 miles, and when ever I have washed the bike or been riding on wet roads. I clean it from time to time with a degreaser. For lubricating the chain I use a spray on lubrication, I have used several brands, and it seems that there are no big difference between them. My favourite though, would be the CRC chain lube. It is not the cheapest, but the size of the spray can makes it easy to bring along. In fact, I can store it in the tool box under the seat. This is for those who have got a belt driven 400/440 and want to convert to chain and sprockets. The only part that is different between the belt and the chain driven models is the chain guards. The pulleys and the sprockets are interchangeable, and will bolt straight on either way. 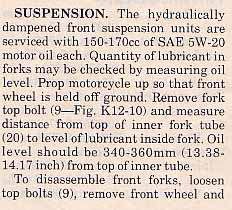 There were some complaints about the suspension in several road tests back in the 70's. And it was described how this influenced on the road holding. 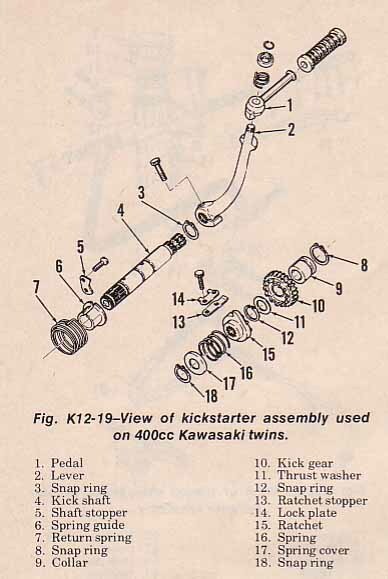 In a long term test made by Cycle World back in 1974, they improved the front damping by installing a KX 125 fork kit (kit number 144) which extended the fork travel by one inch. The rear shocks were replaced with Koni shocks with adjustable preload, and they claimed that this was a great improvement to road holding. I have fitted a small windscreen to my bike, and since I like to cruise around at speeds between 50 and 70 mph it doesn't worry me if the screen should make it difficult to reach top speed. I think that the advantages are fare to great. One thing to remember when you add a handlebar mounted windscreen is that it can influence on the road holding. Heavy wind and the wind pressure you get when you meet large trucks can make the bike unstable. As long as you are aware of the problem, you can live with it. The screens also produce some wind noise, and it is noticeable, and I always use earplugs when I drive. And you will hear the engine sounds better. The advantages with the screen are that you get rid of the air pressure on your chest, and if it rains you don't get the rain on your upper body and your face. It also keeps the bugs away. And if you, like I do, are riding early in the spring and late fall, it will keep some of the cold air away. You will find some very good advise about winter storage here. In addition to the tips I have linked to, I would like to add a couple of things. Since I live in a country with a tough climate, and my bike is stored in a cold garage I always spray the whole bike with CRC-556, Quaker State QS-14, or something similar before I put the bike away for the winter. I cover the bike completely with the stuff. And in the spring I wash it off with a mild degreaser and water. I also spray in to the exhaust mufflers. I never remove them from the bike, but I spray CRC in to the mufflers from the rear, and I keep on spraying till I see the CRC begin to drip out from the drain holes in the front end of the mufflers. I have also tried WD40, but I didn't like it. When it dries up it turns in to some sort of wax that is very hard to remove from the bike. And I'm not sure that the WD40 have got the same protective quality as the CRC. 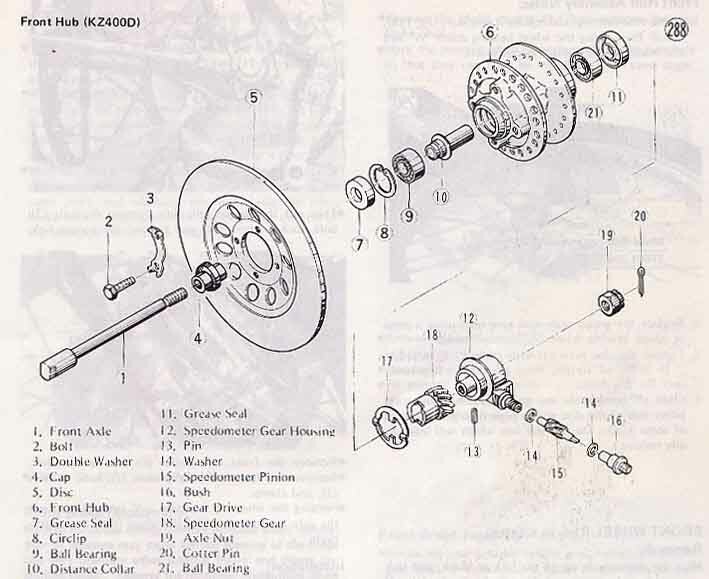 Many bike owners have experienced that the bike is running fine when they put it away for the winter, and that it is very hard to start in the spring. And this is also my experience. 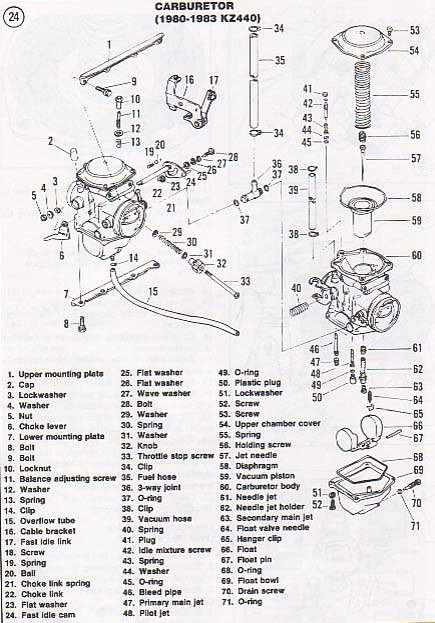 This is the method I have found to be the best for my bike when I am starting the bike for the first time after the winter storage. Usually it can be a pain to start these bikes after a long storage. And if they are stored cold during the winter, it is even harder to start. And those last three points will also work great if there is any cold start problem. 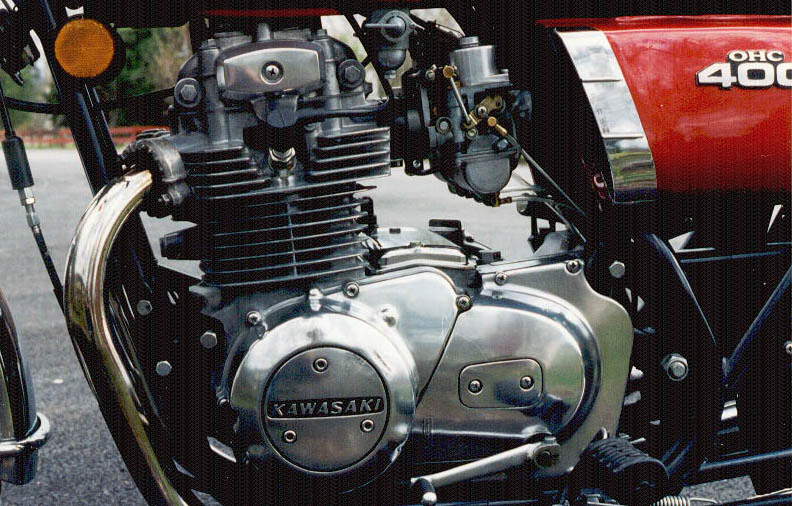 The KZ400/KZ400 is known to be "cold-blooded" and a bit difficult to start when it is really cold. 3. Take out the spark plugs. 4. Crank the engine a couple of times. 5. Warm the engine up with an electric heating fan for 1-1 1/2 hour. 6. Install a set of new, or dry and clean spark plugs. If they have been stored inside your house, they will work even better. Do not use the ones that were in the bike when stored. 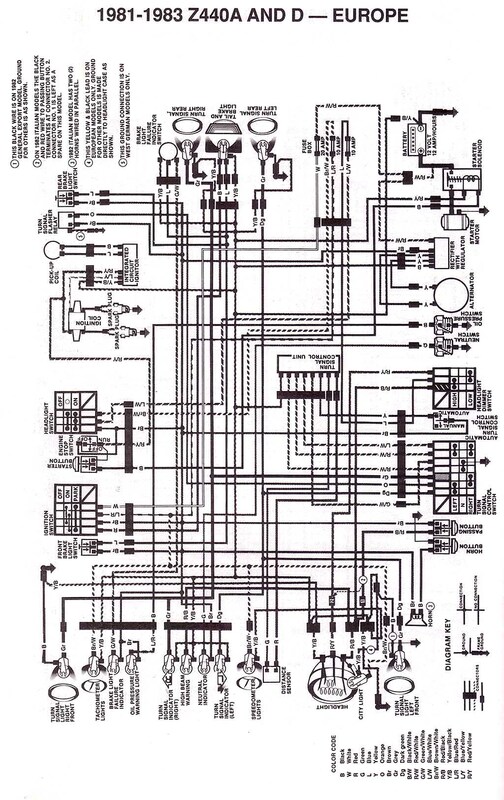 And now the bike should be easy to start up.